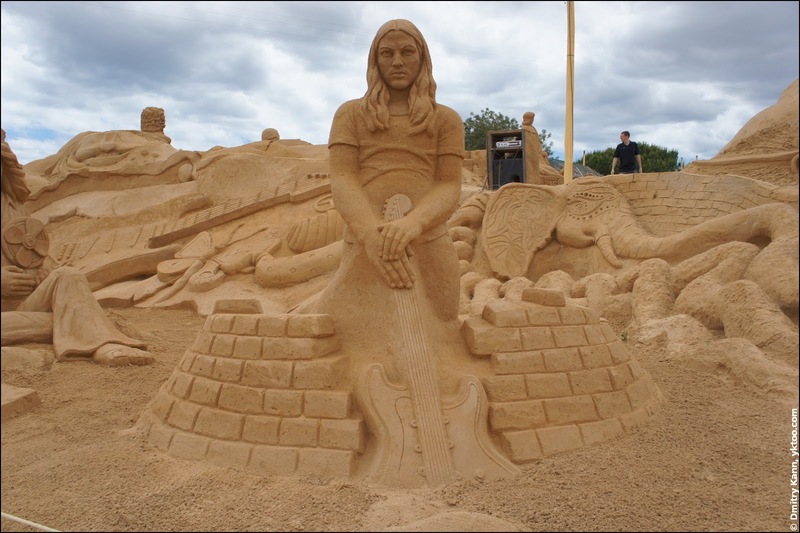 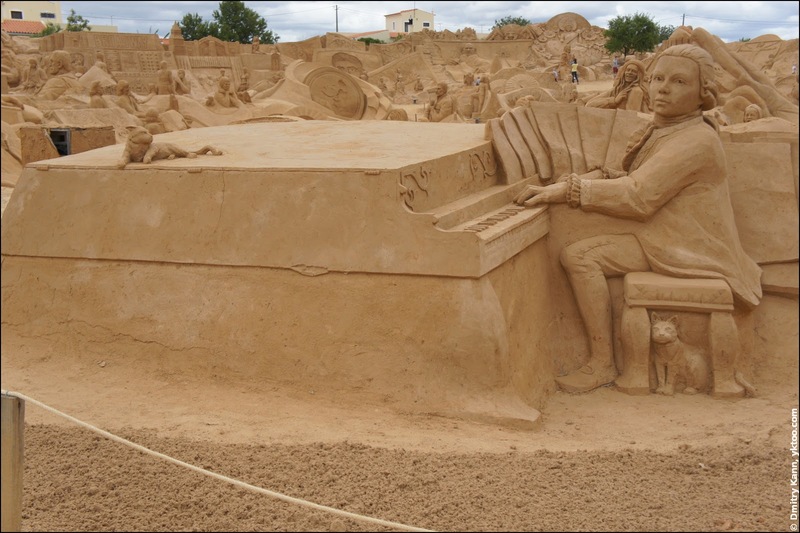 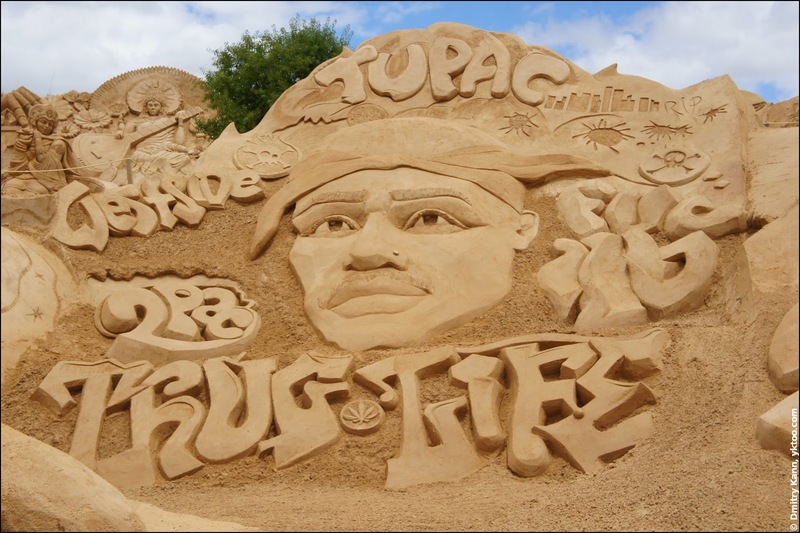 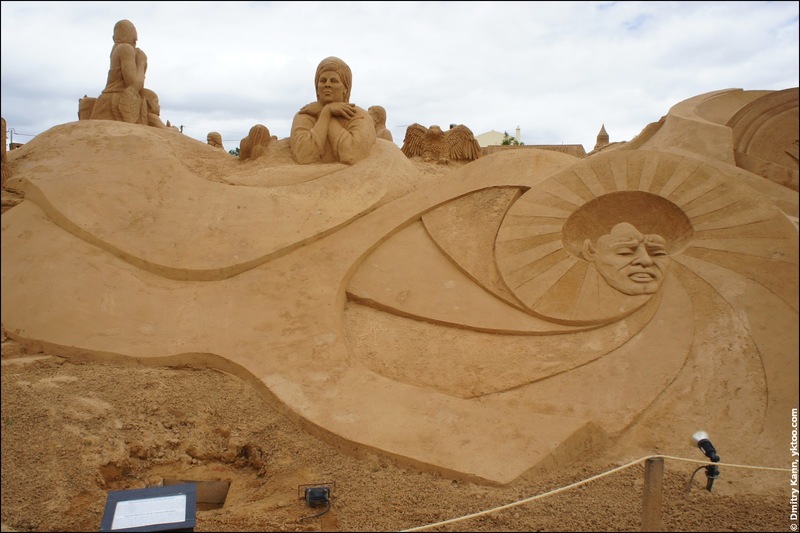 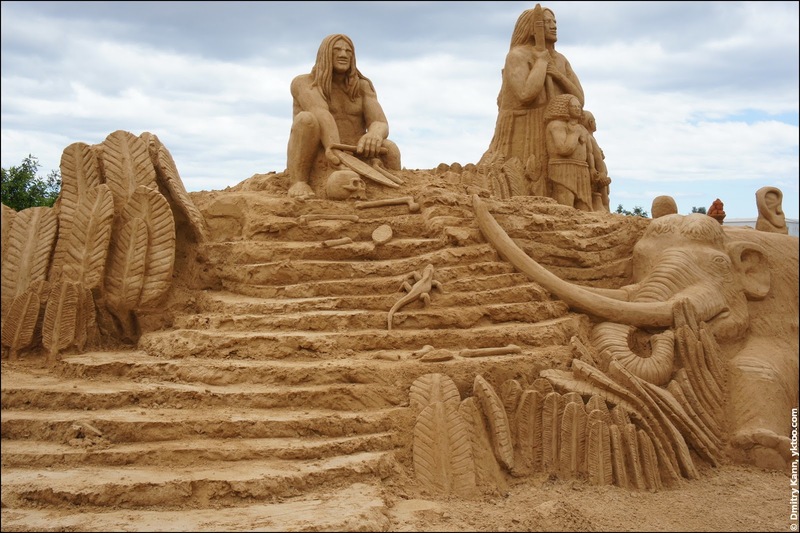 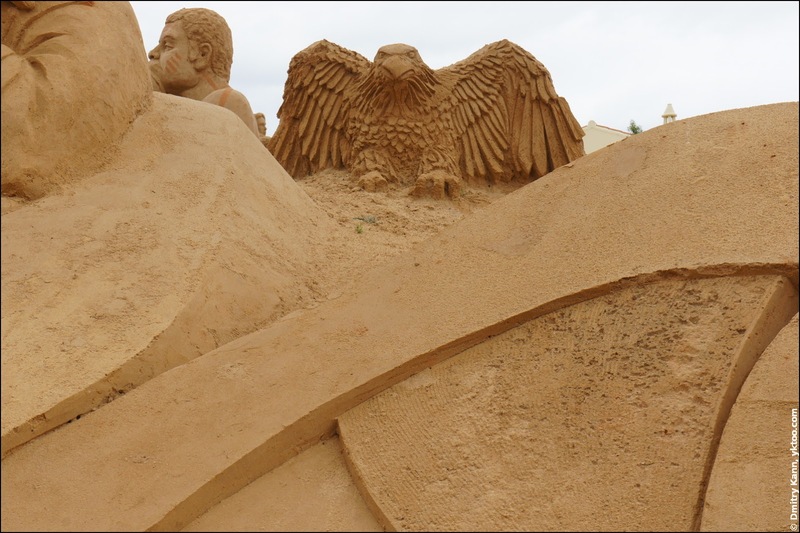 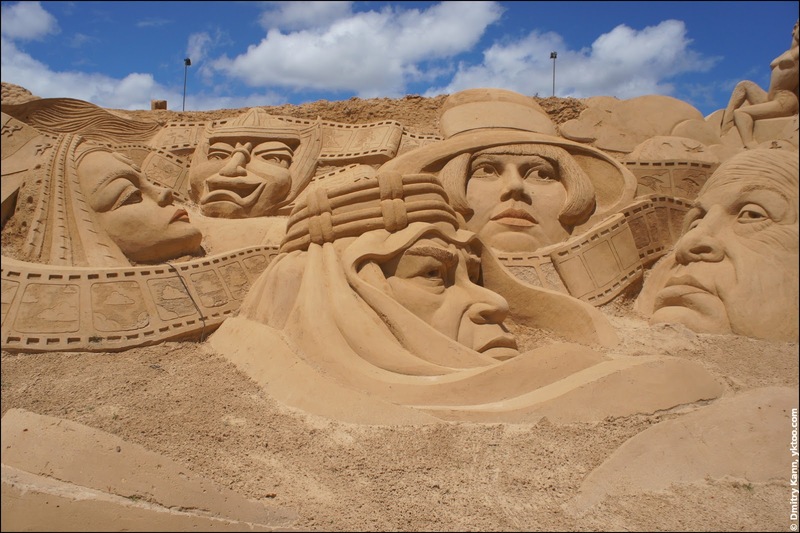 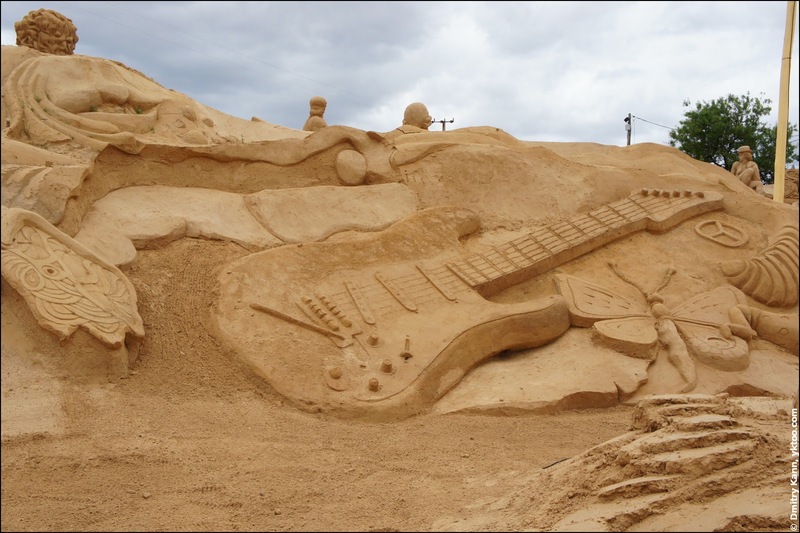 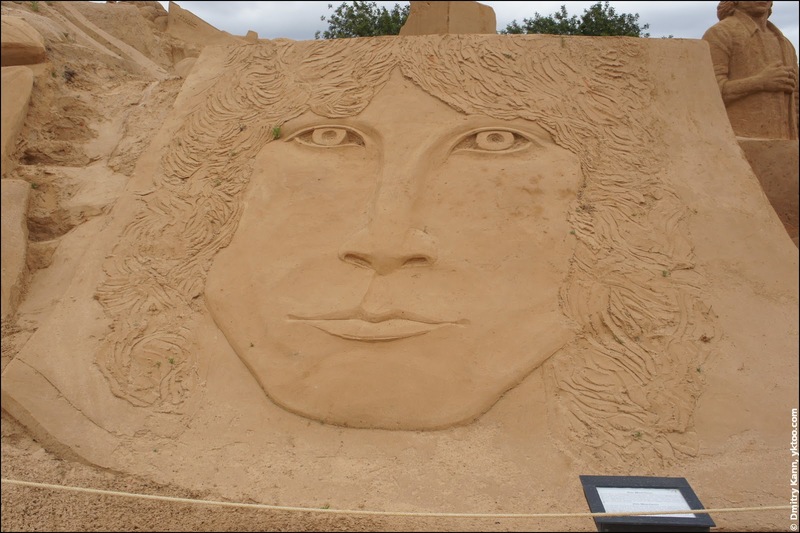 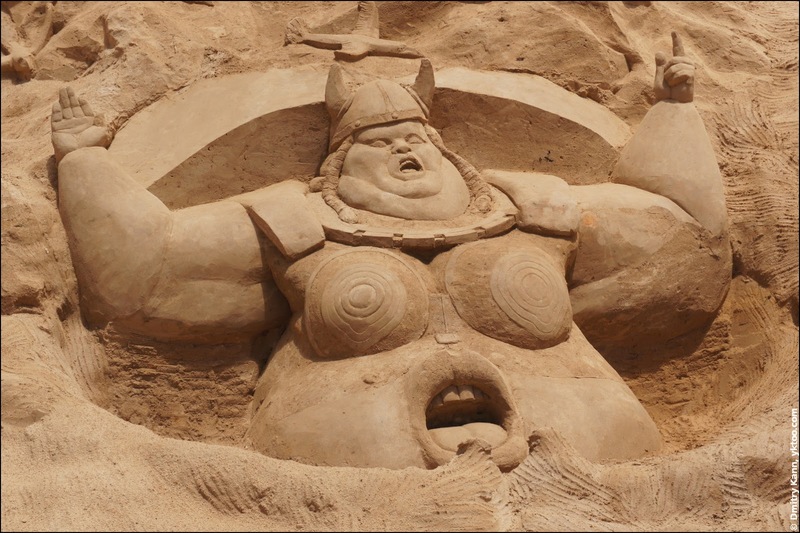 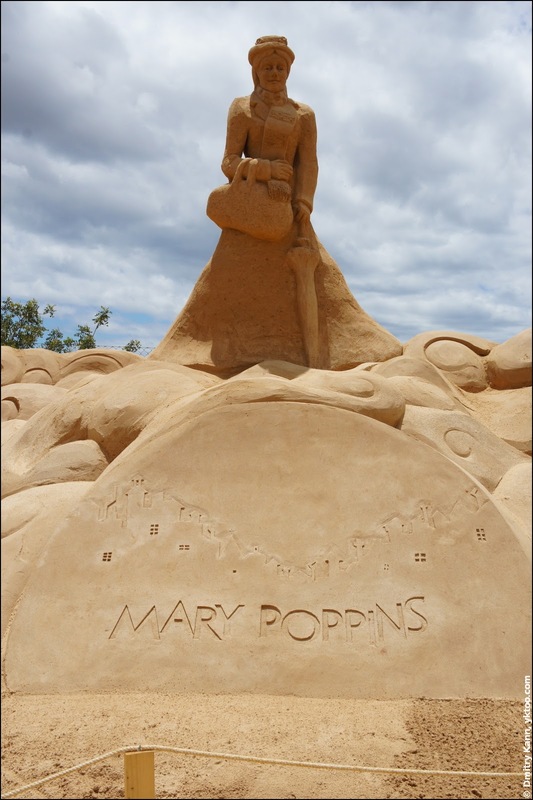 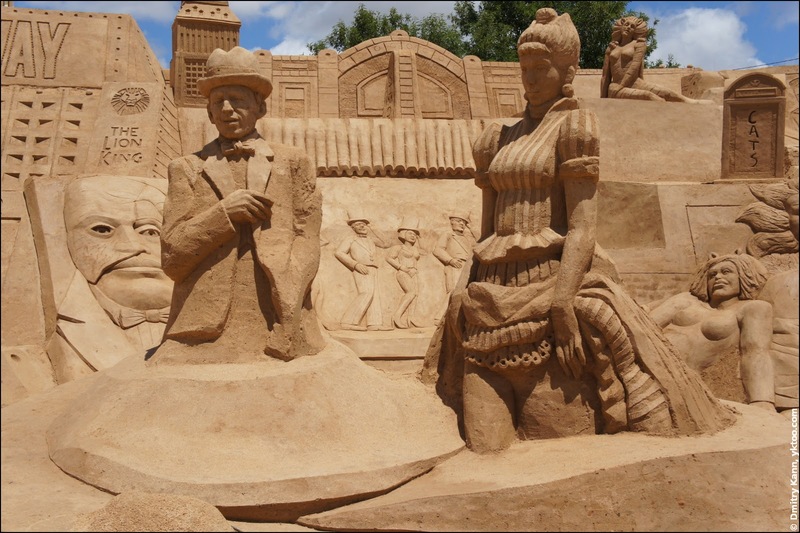 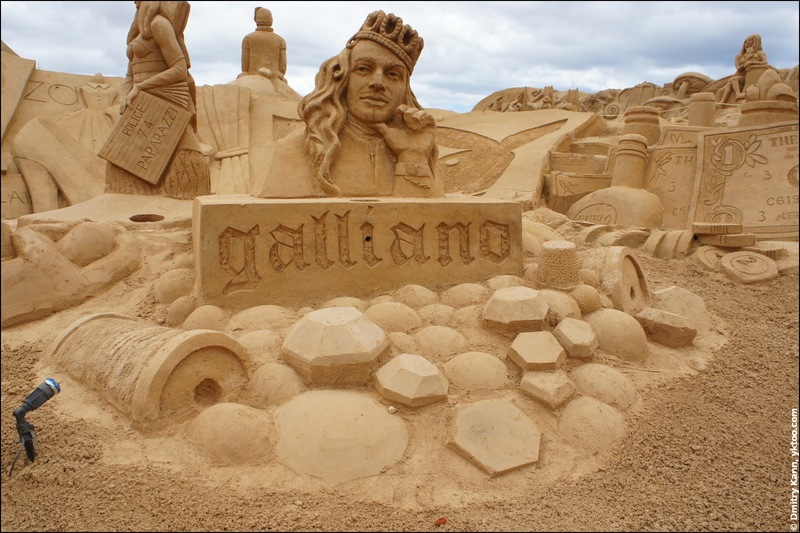 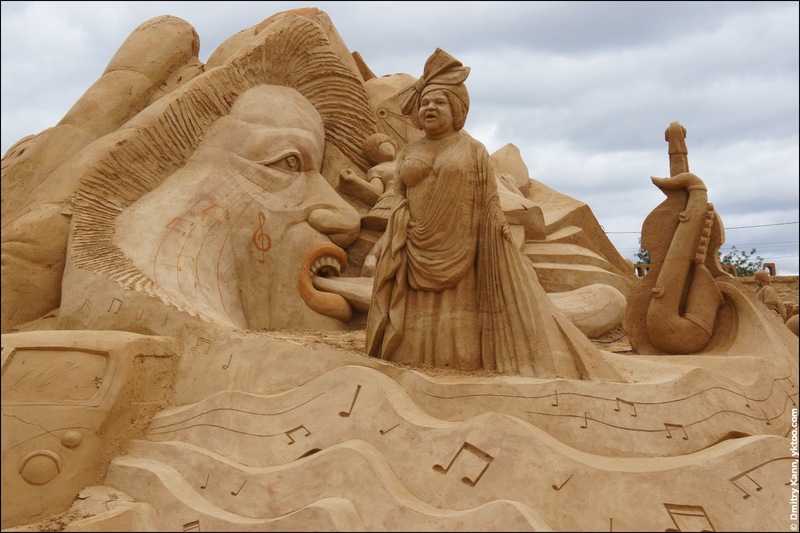 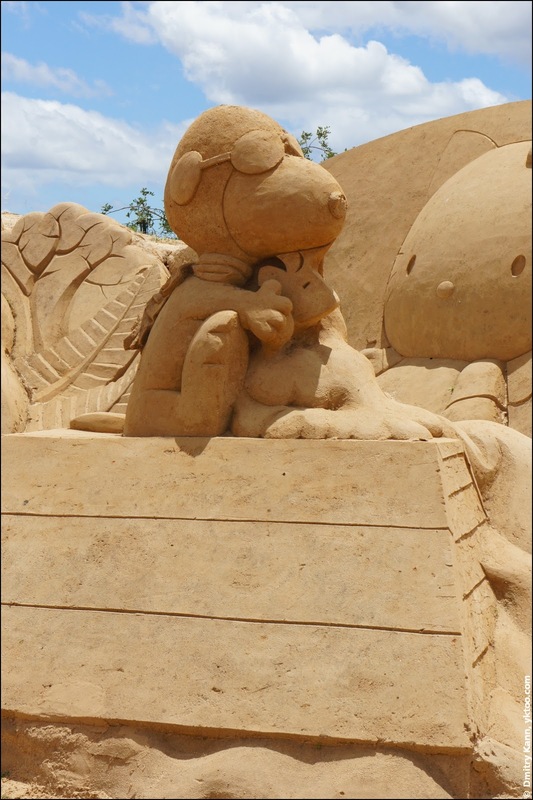 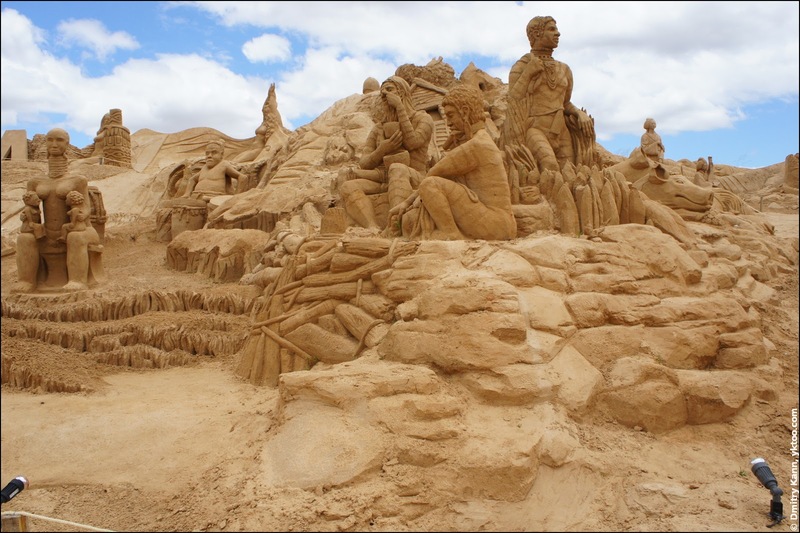 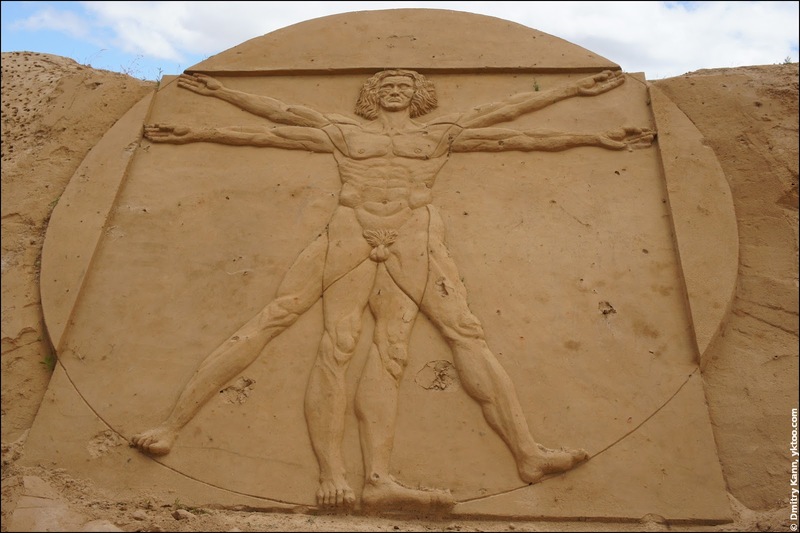 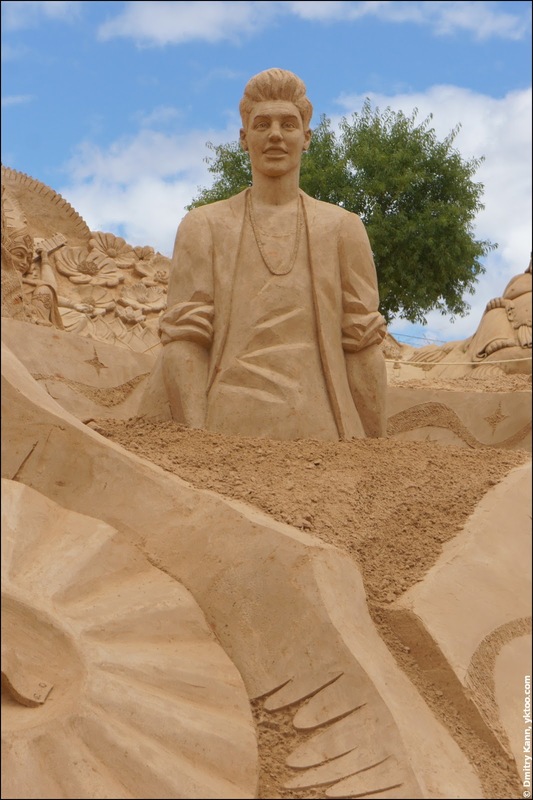 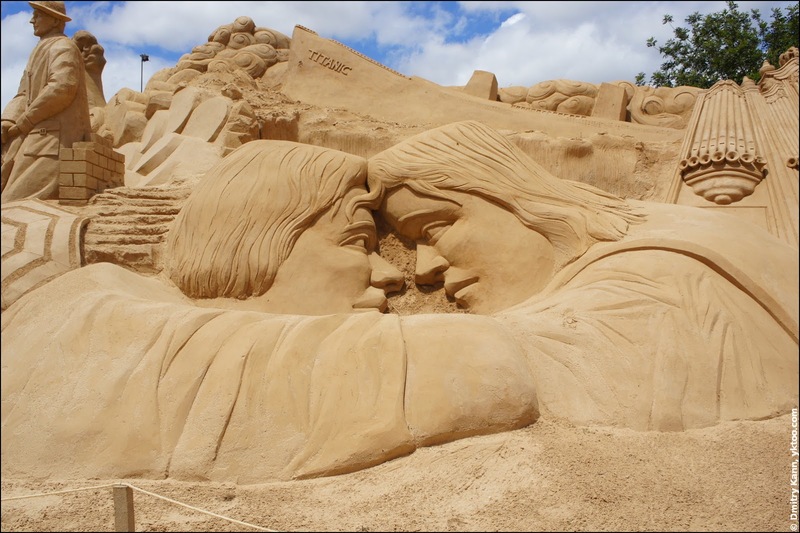 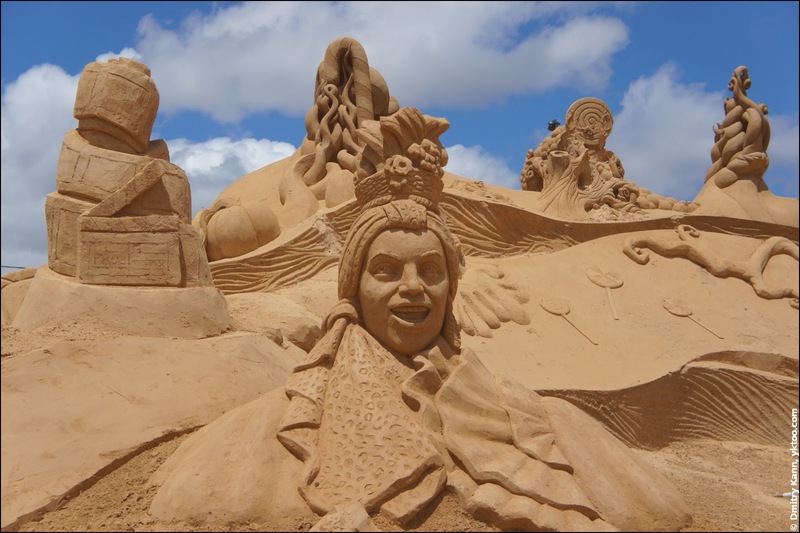 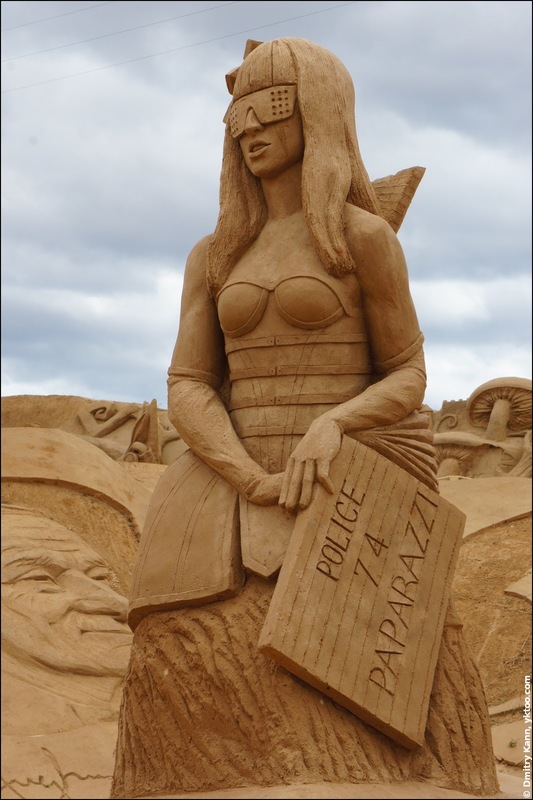 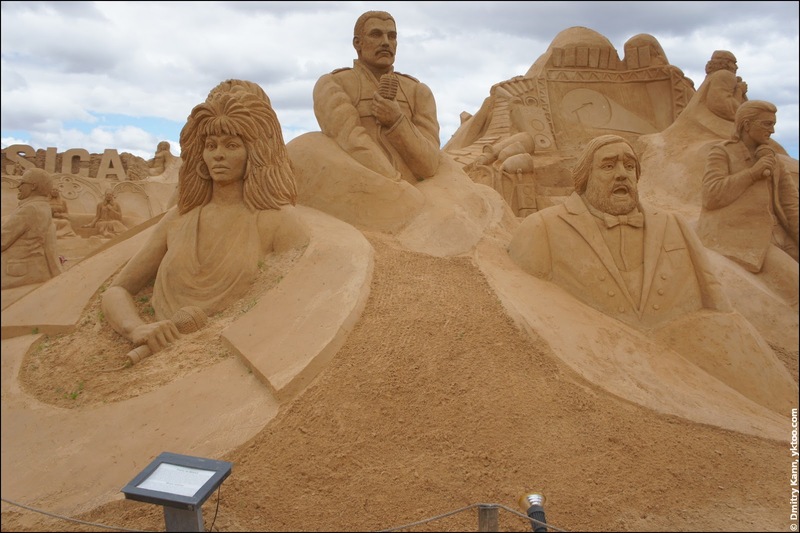 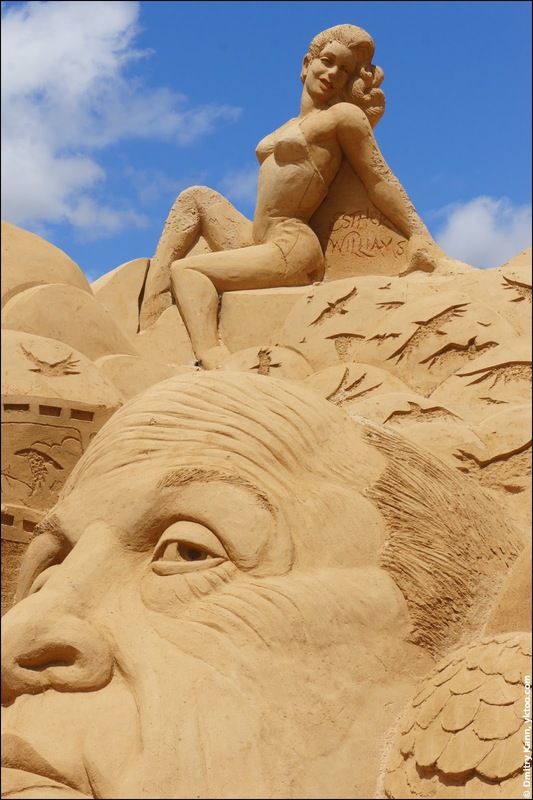 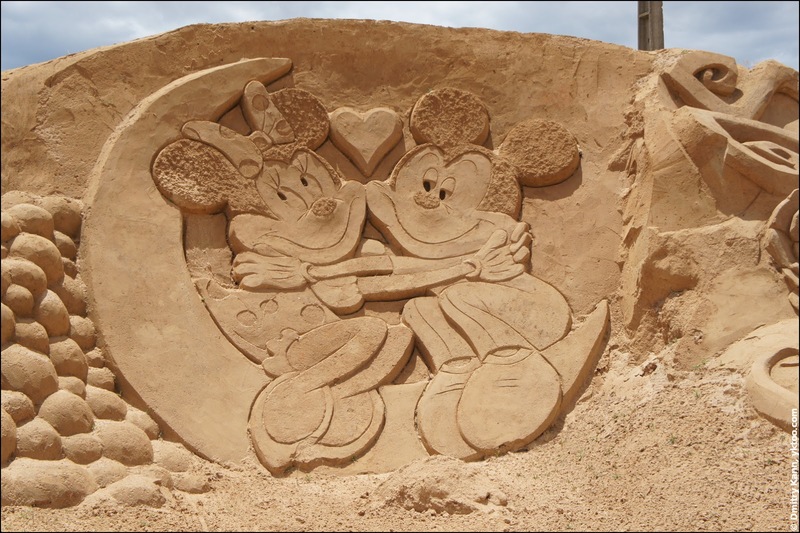 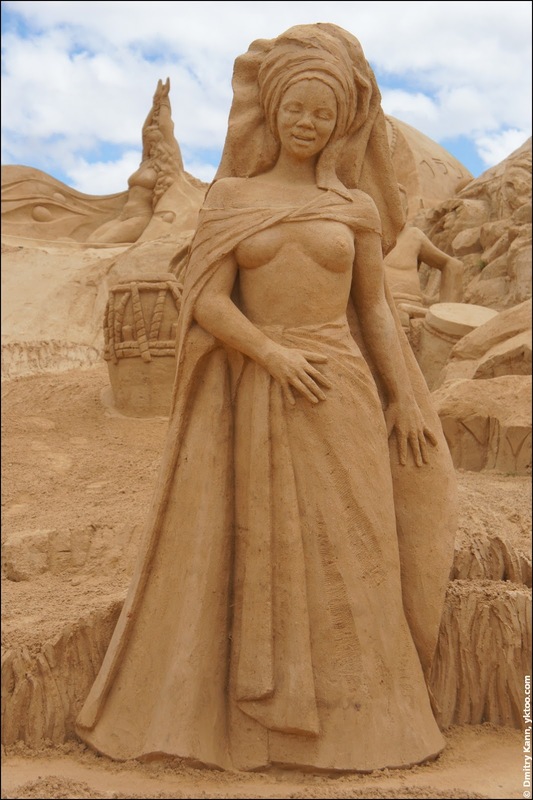 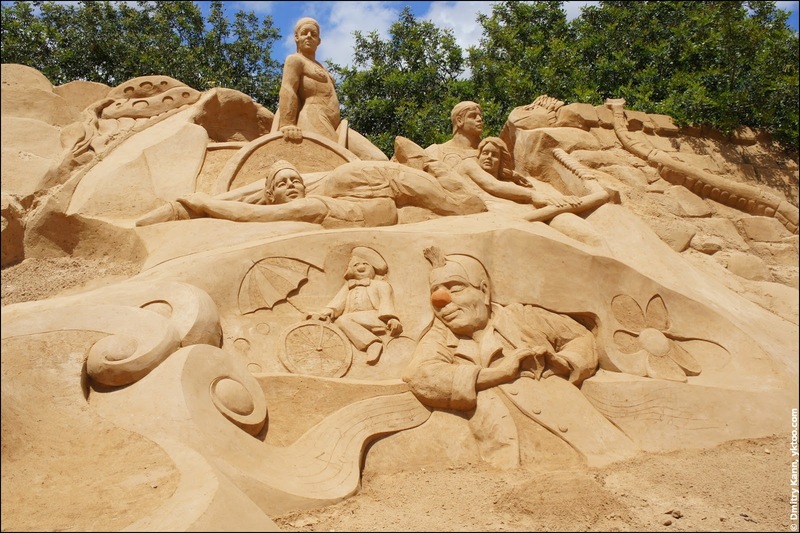 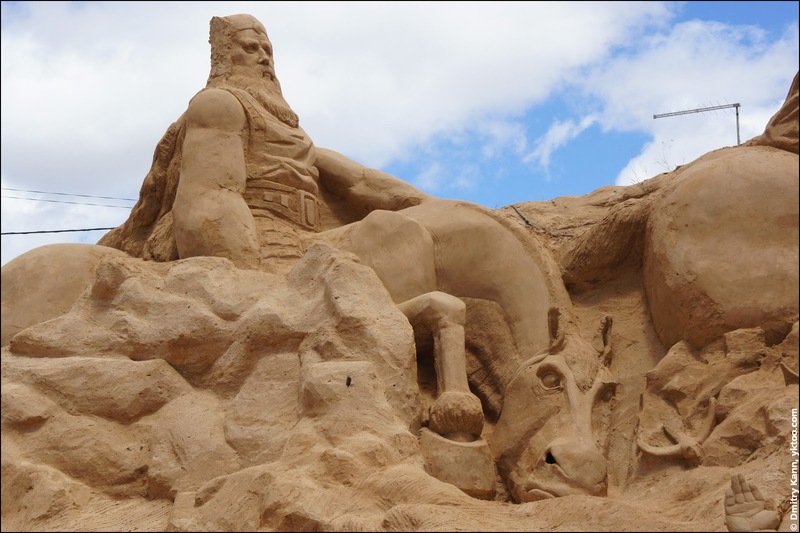 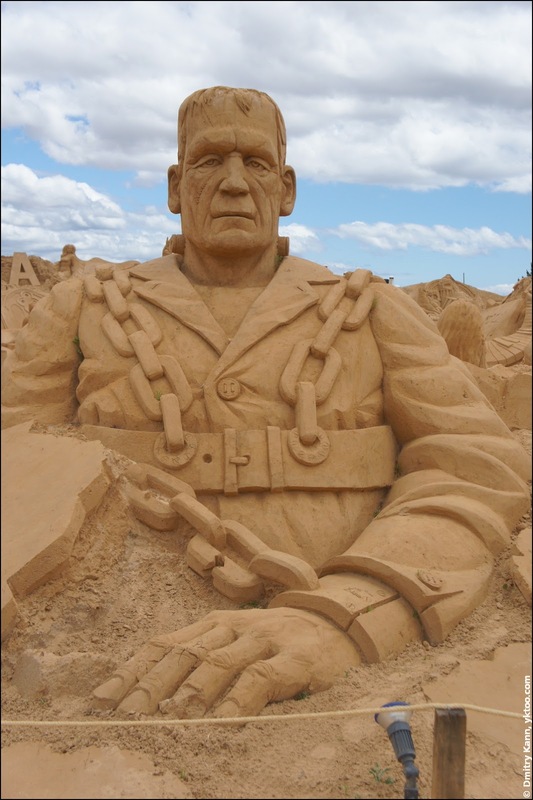 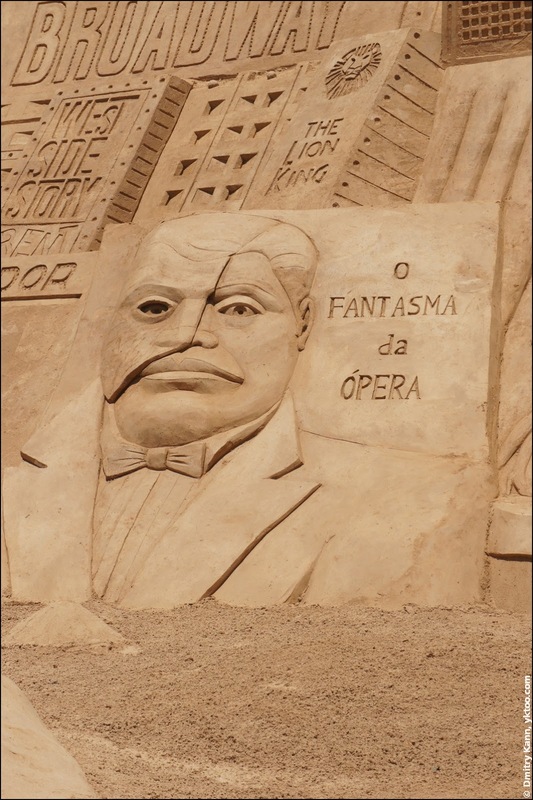 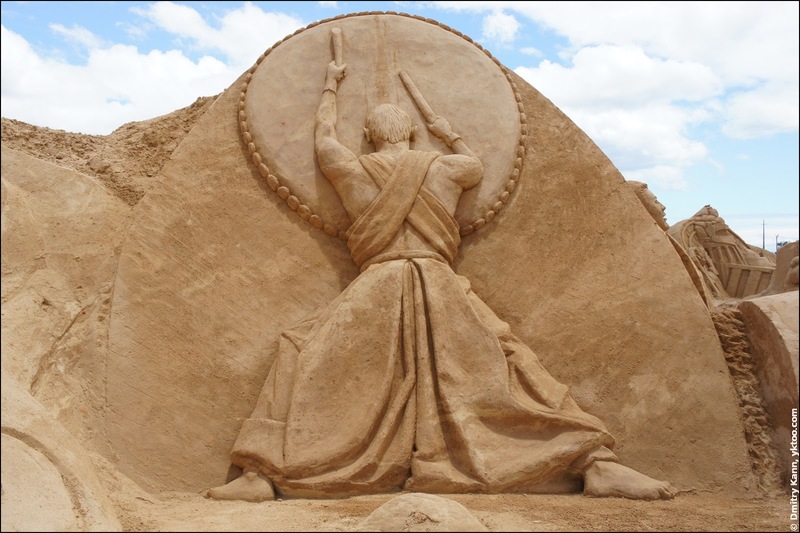 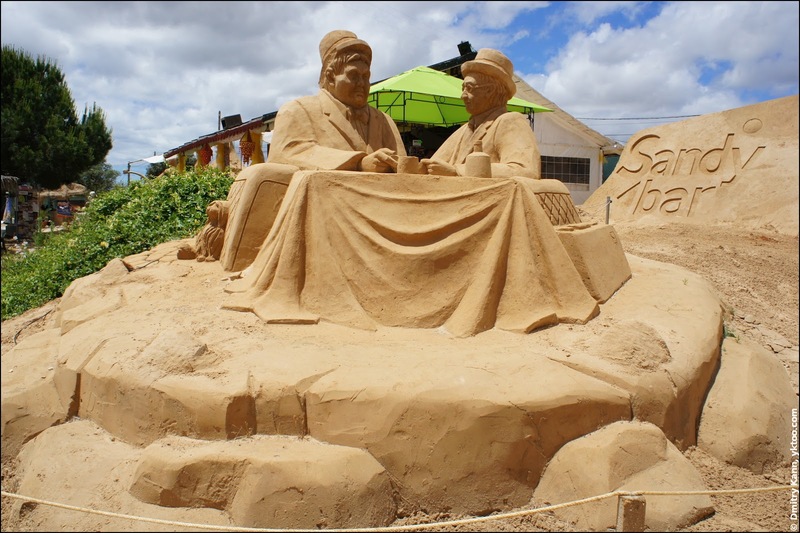 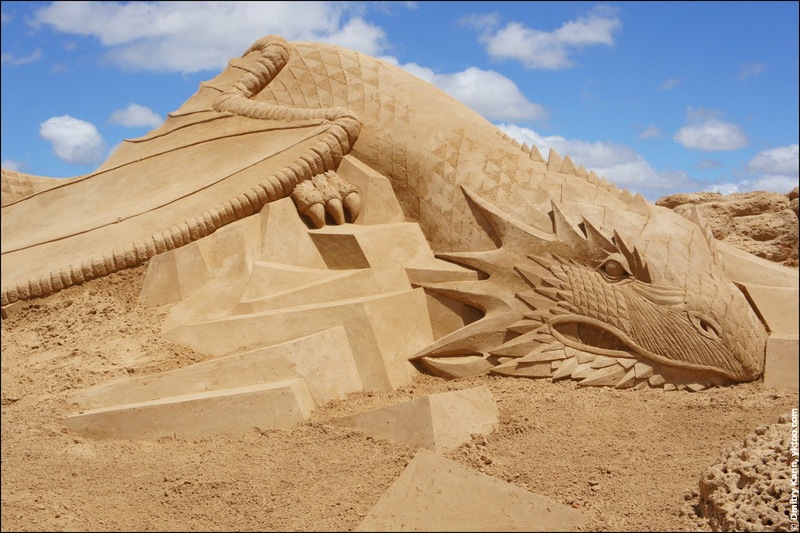 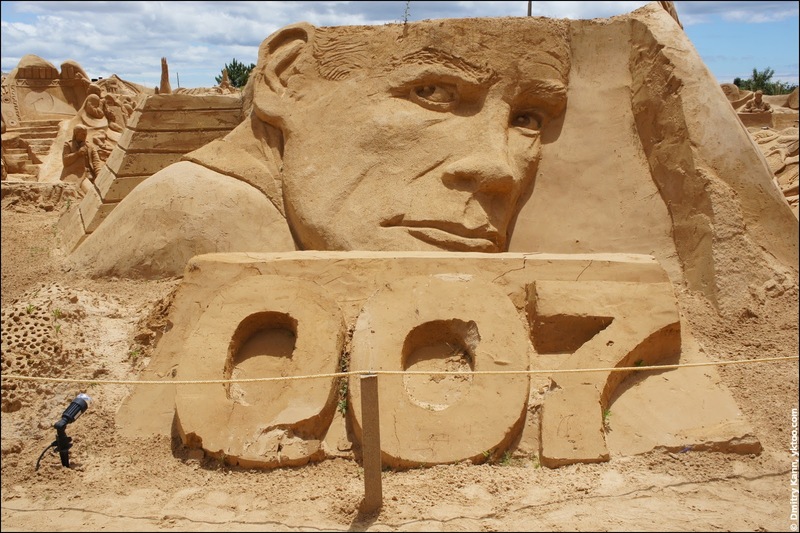 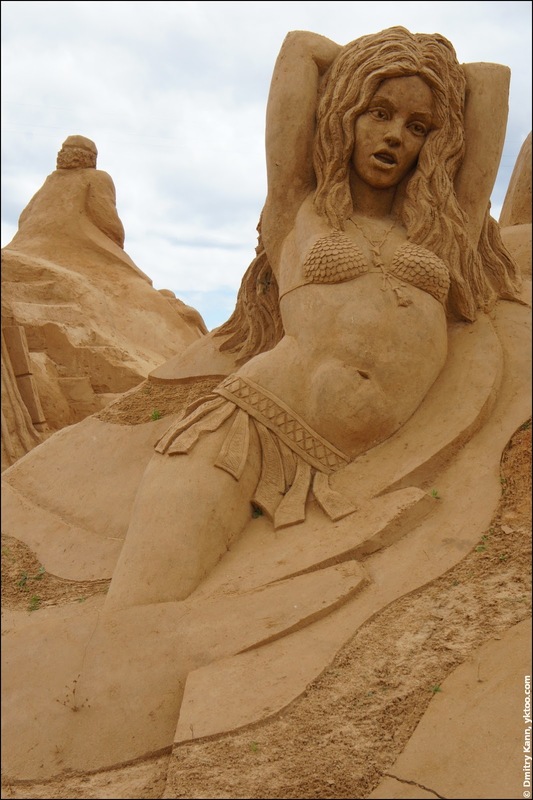 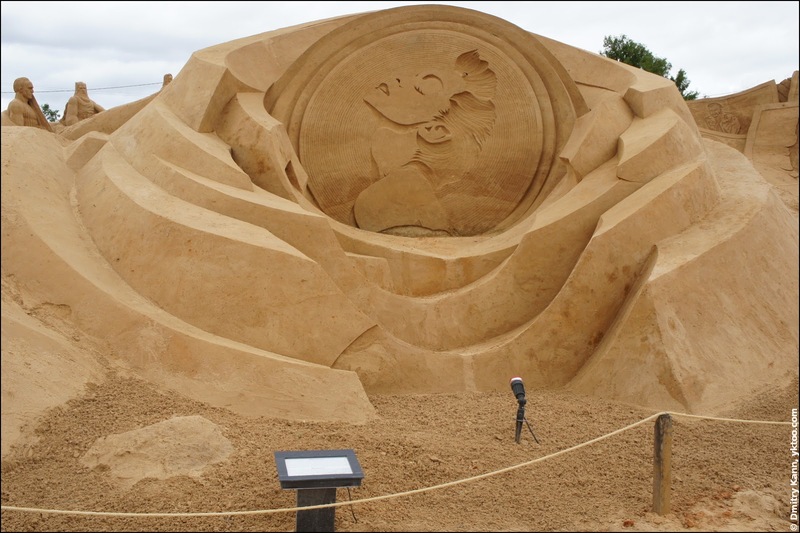 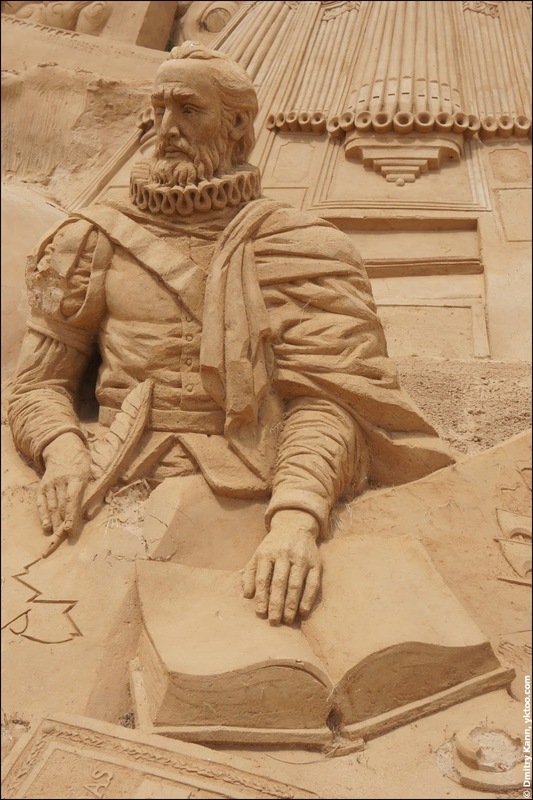 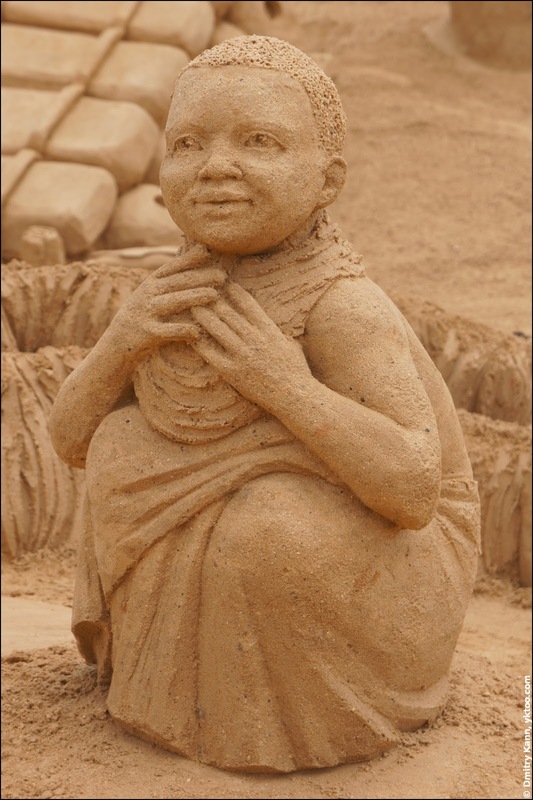 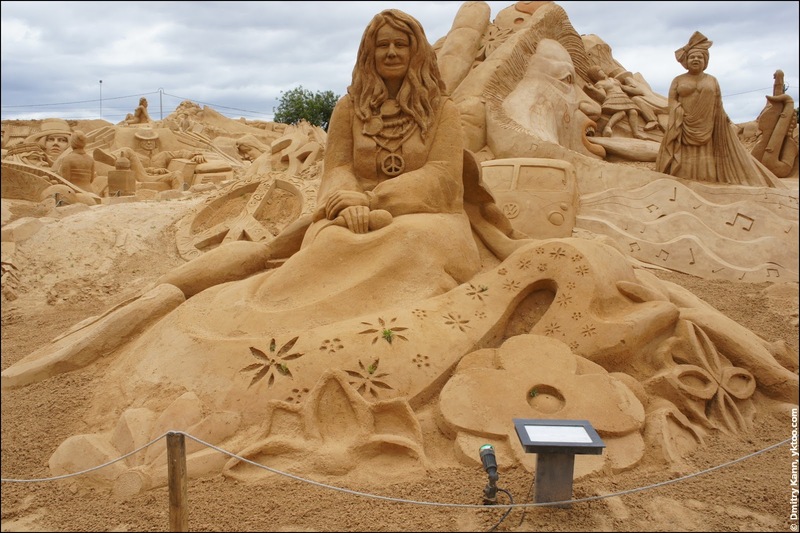 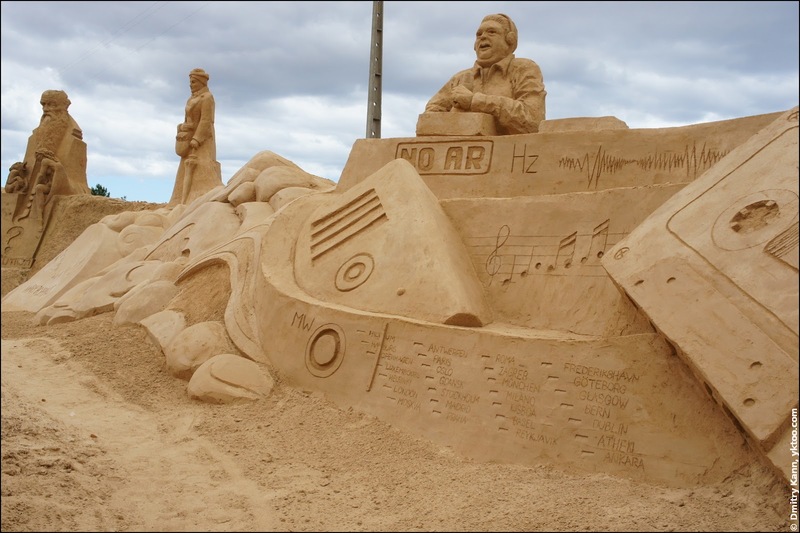 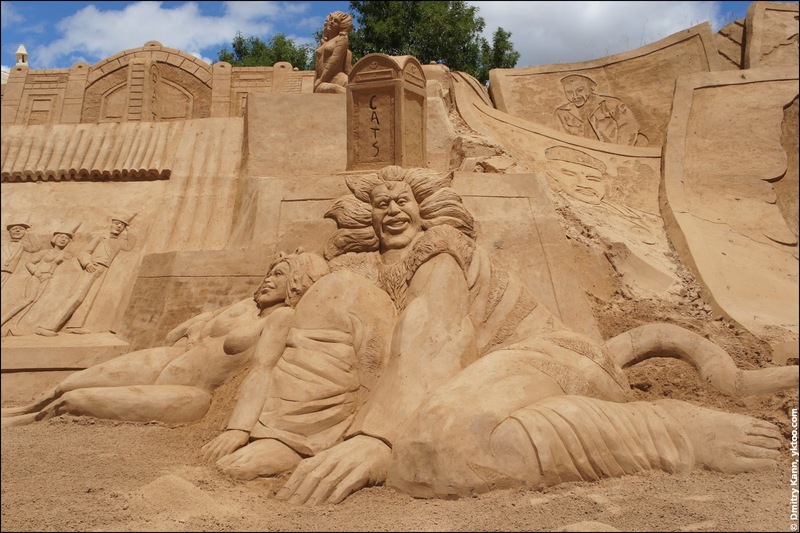 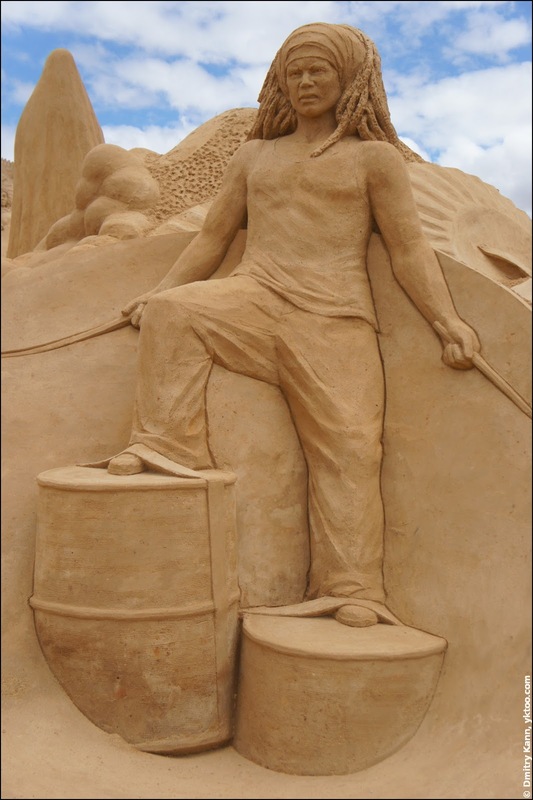 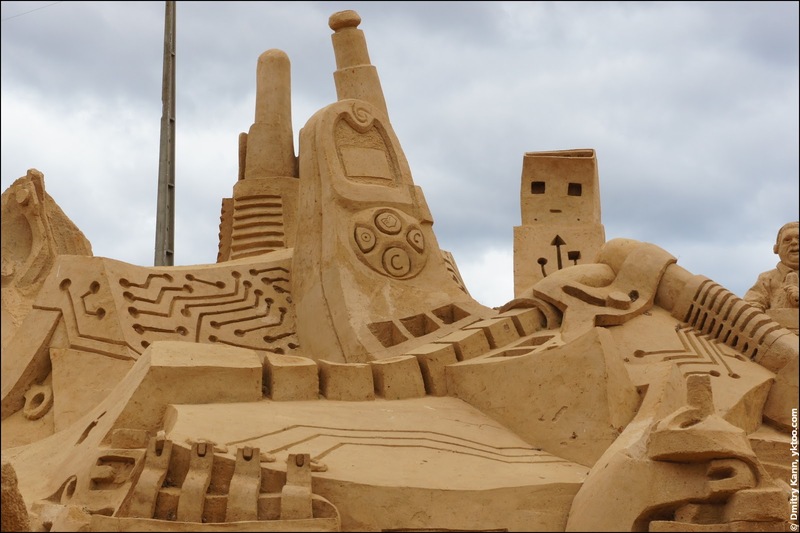 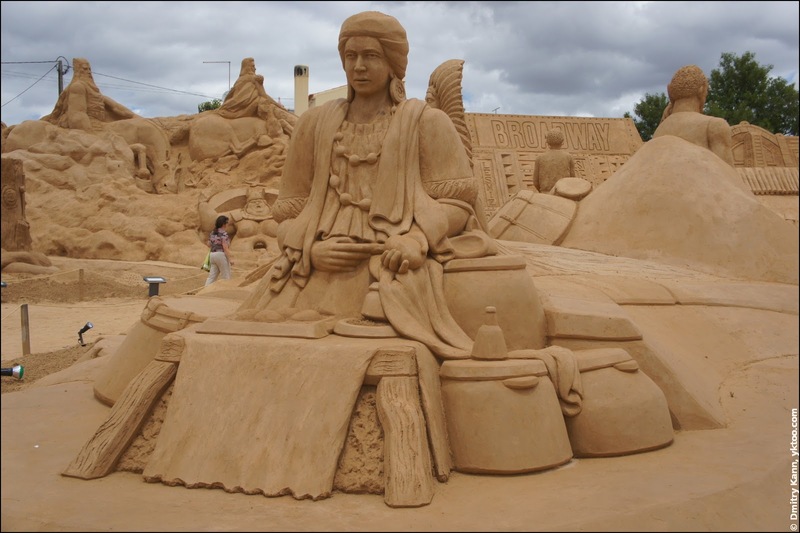 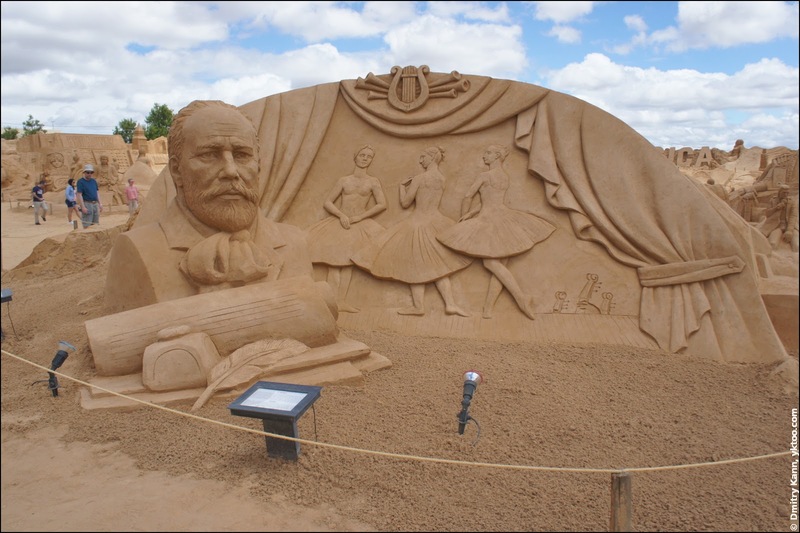 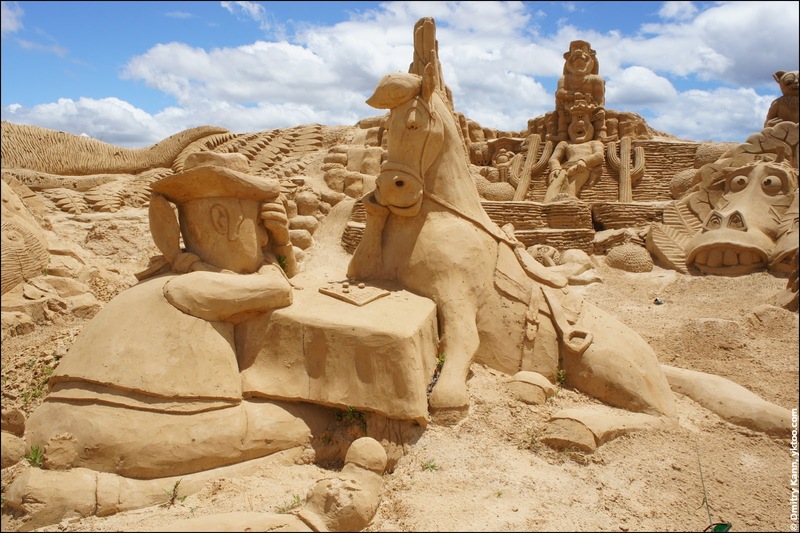 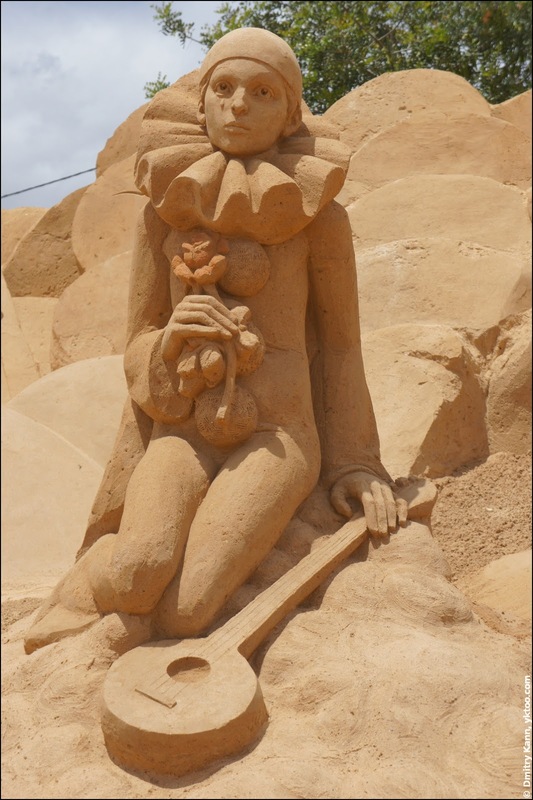 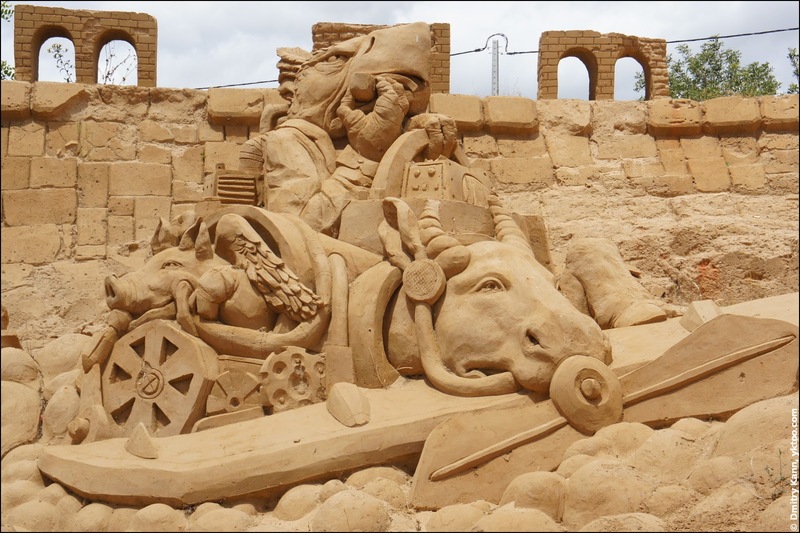 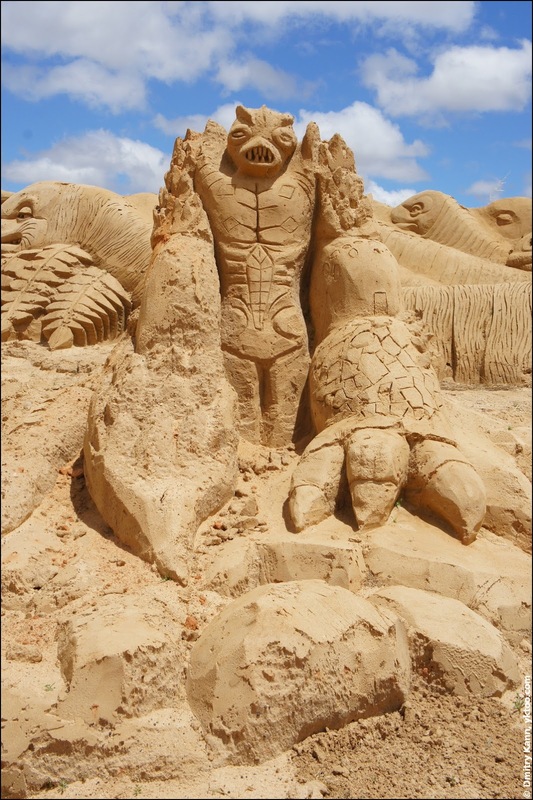 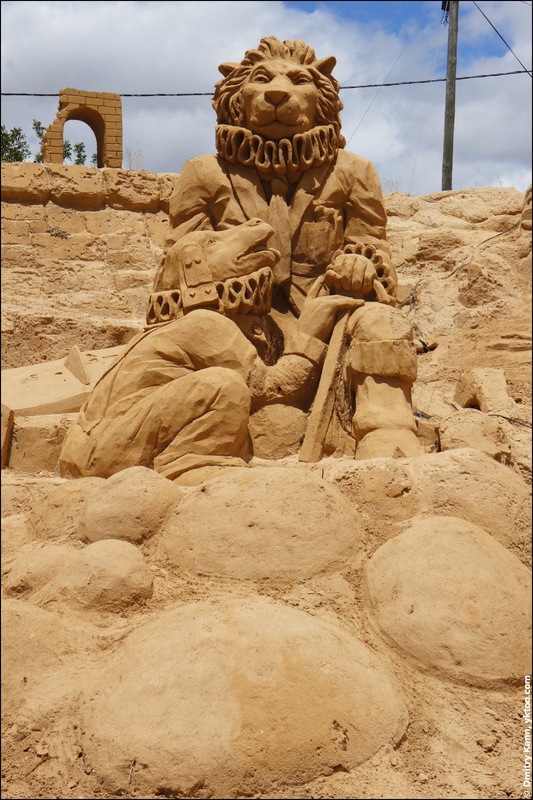 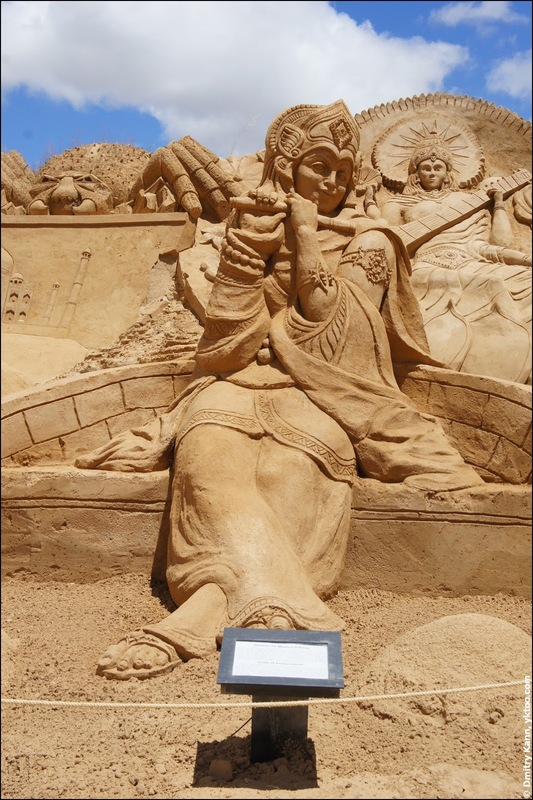 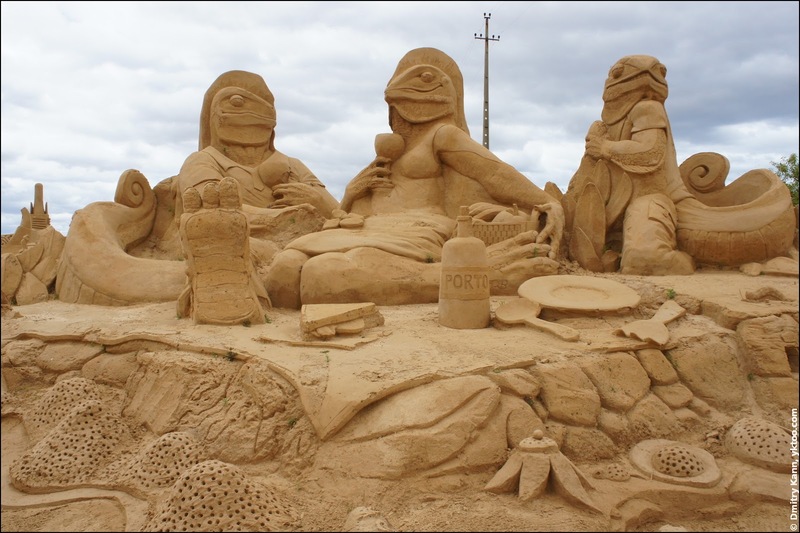 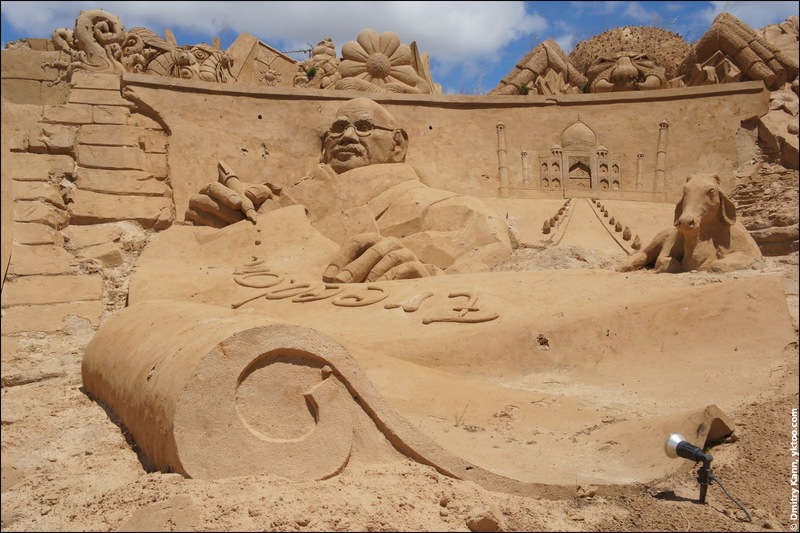 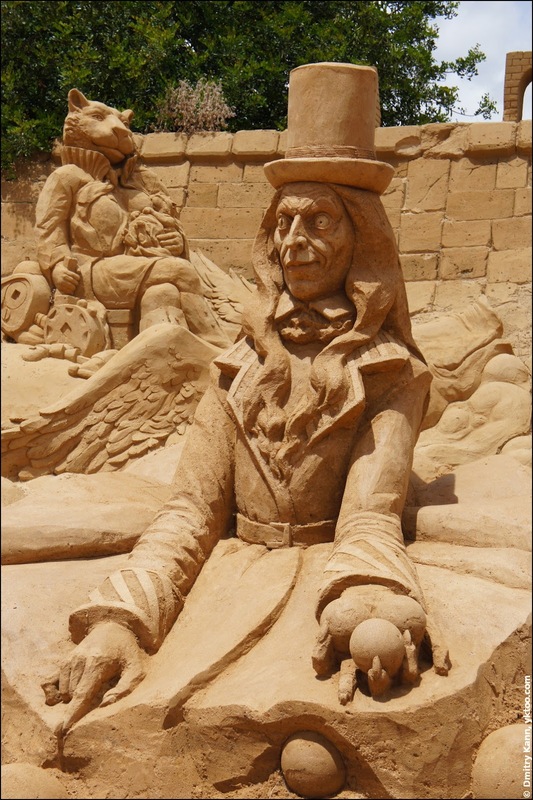 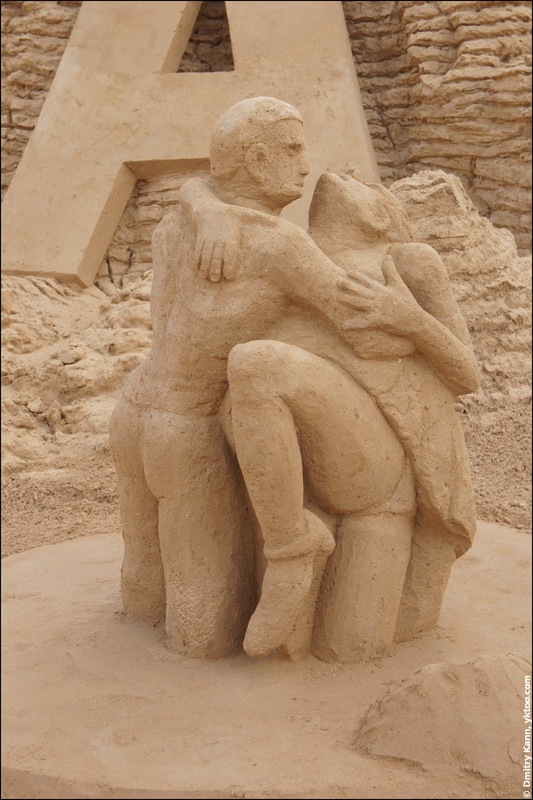 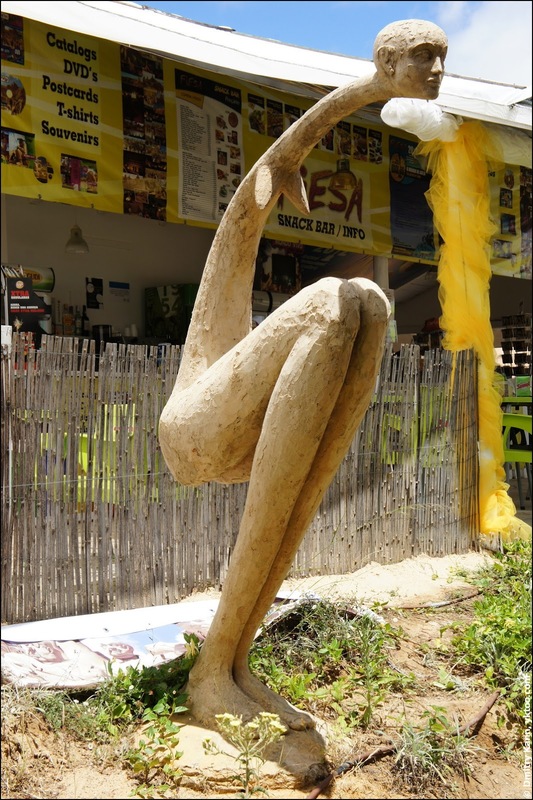 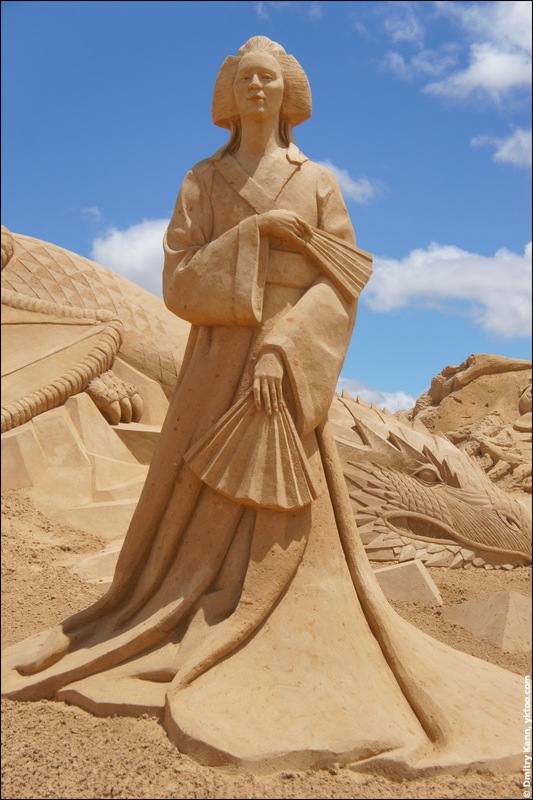 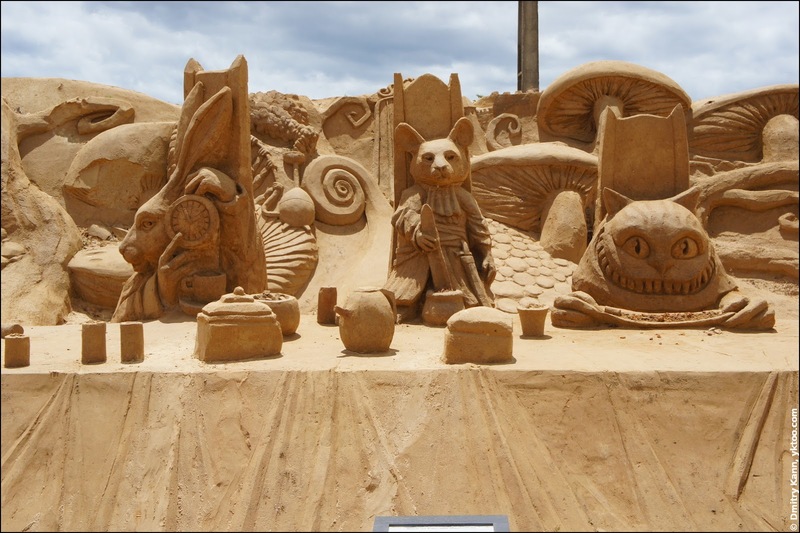 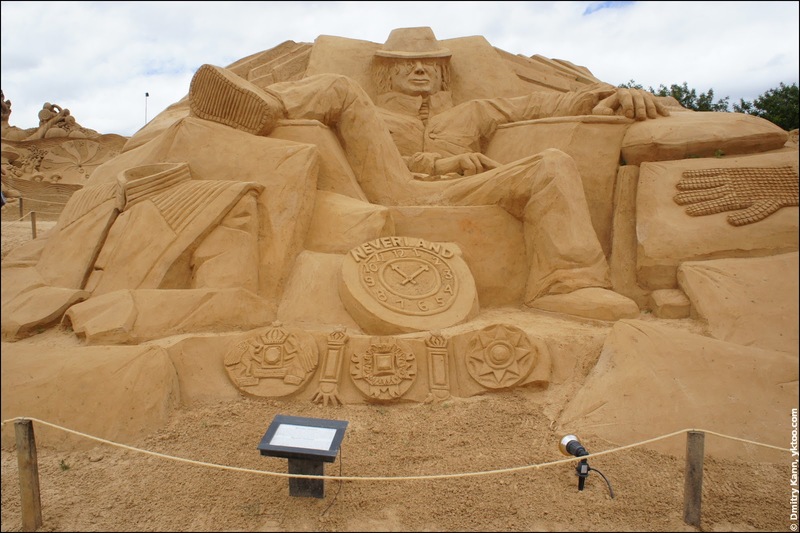 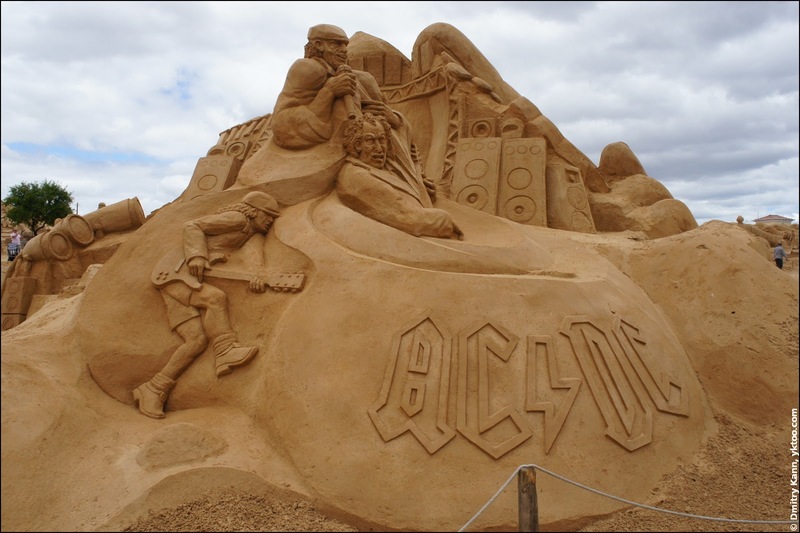 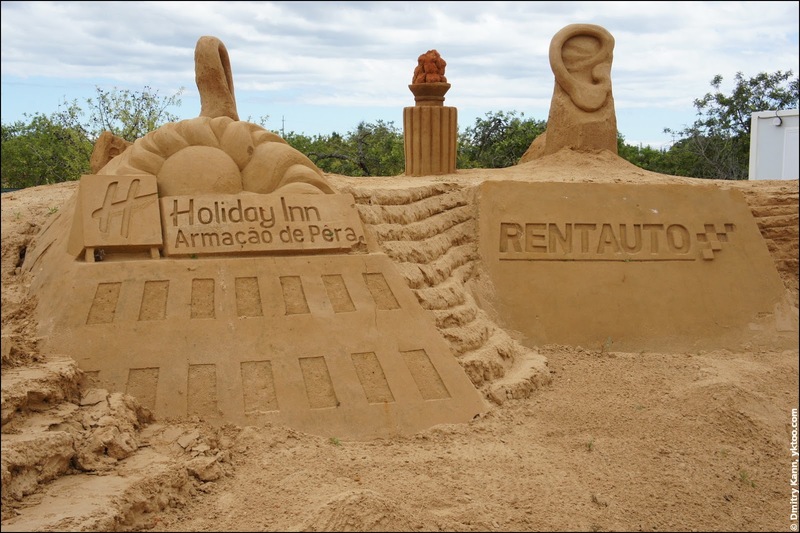 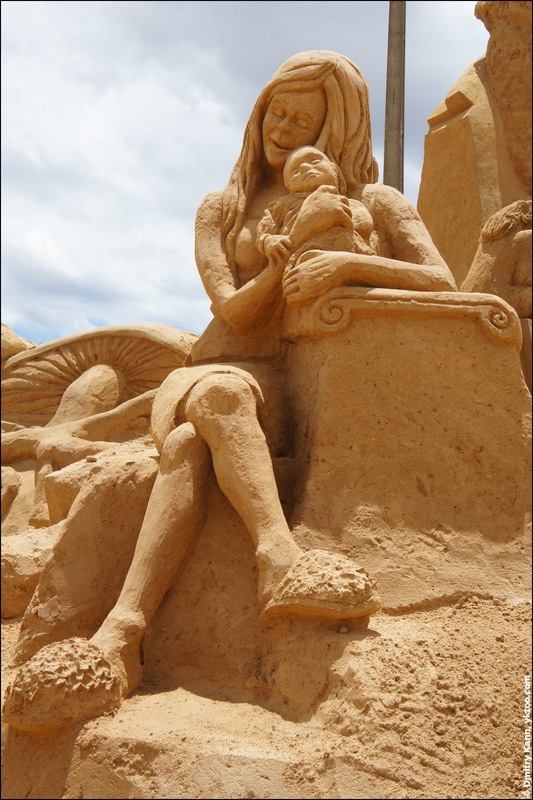 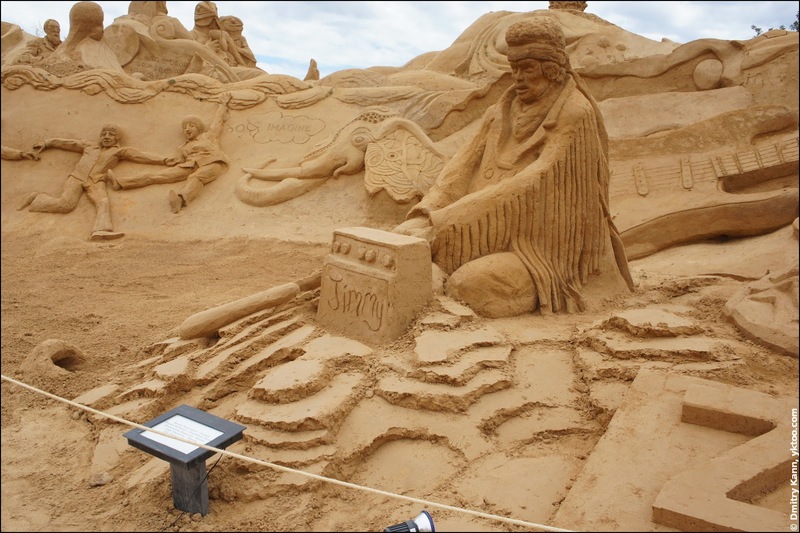 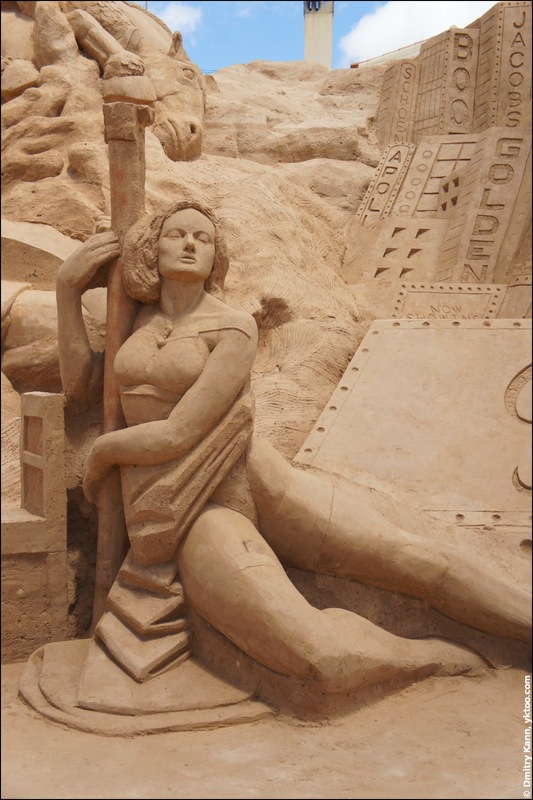 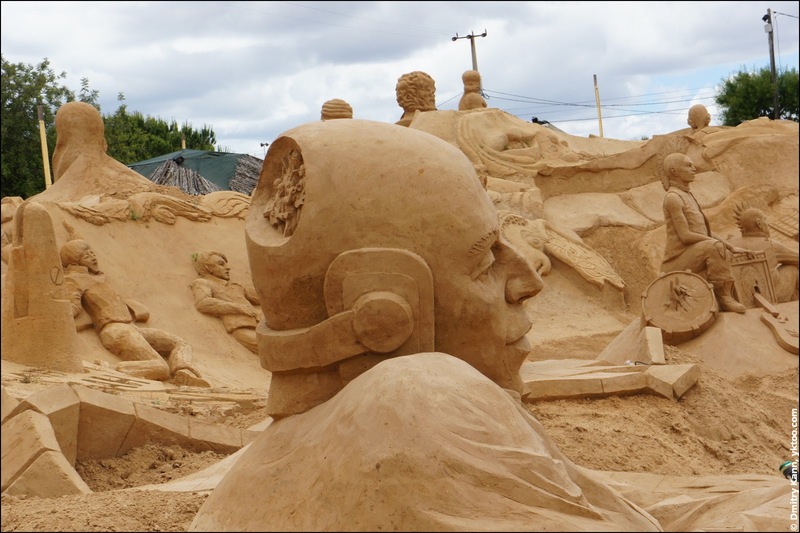 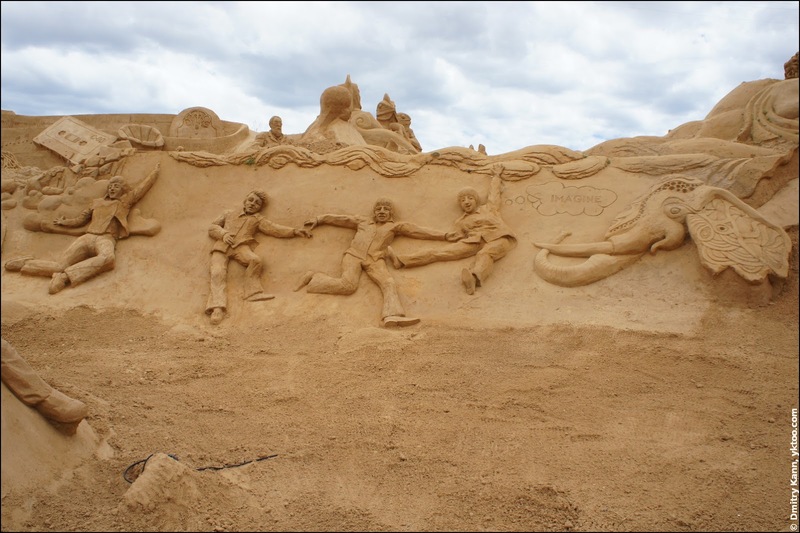 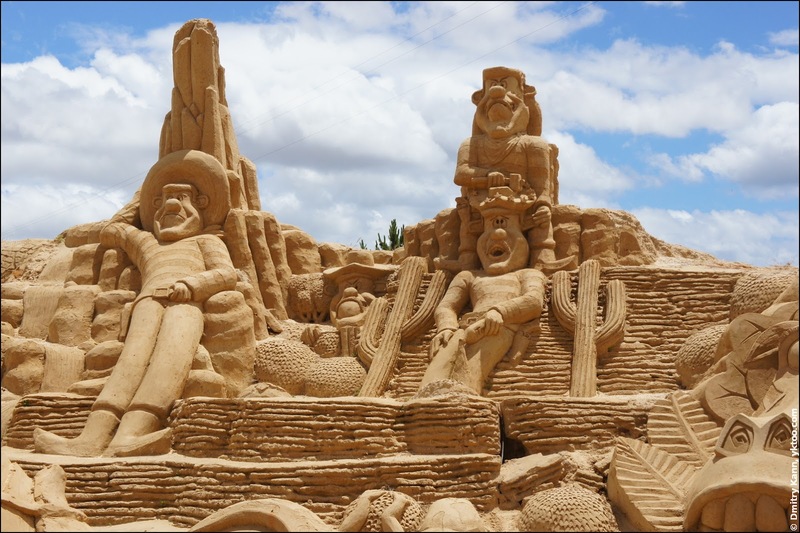 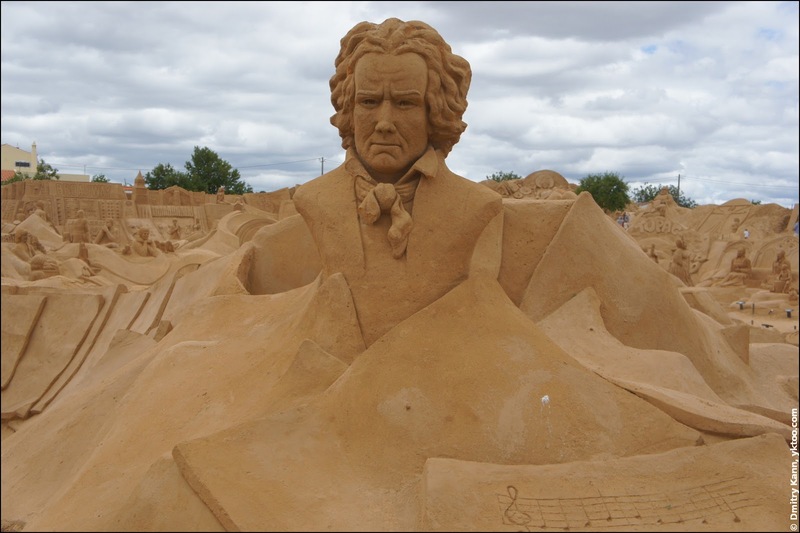 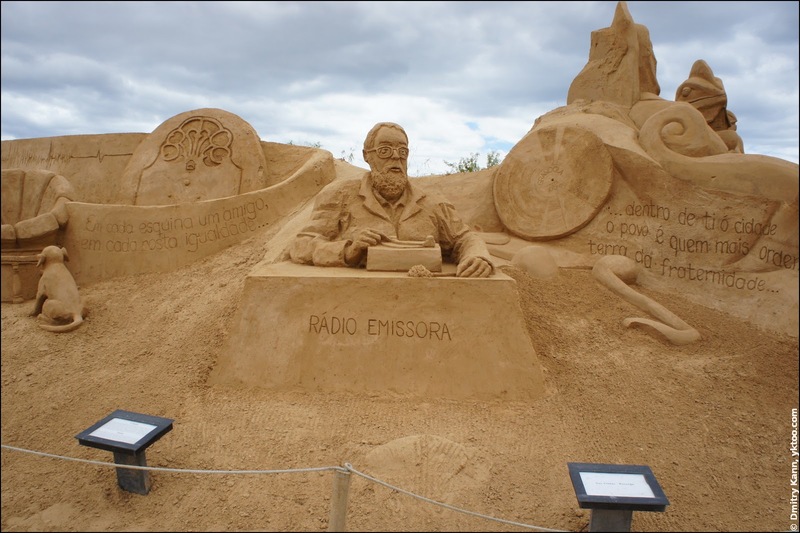 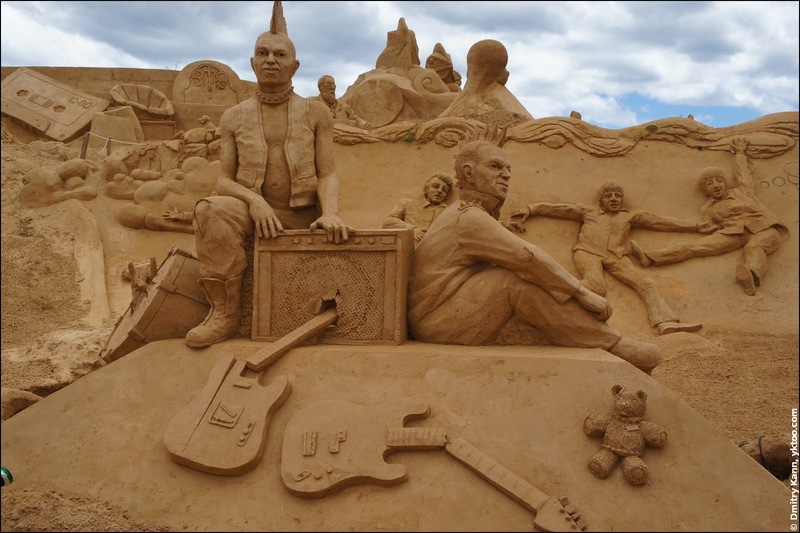 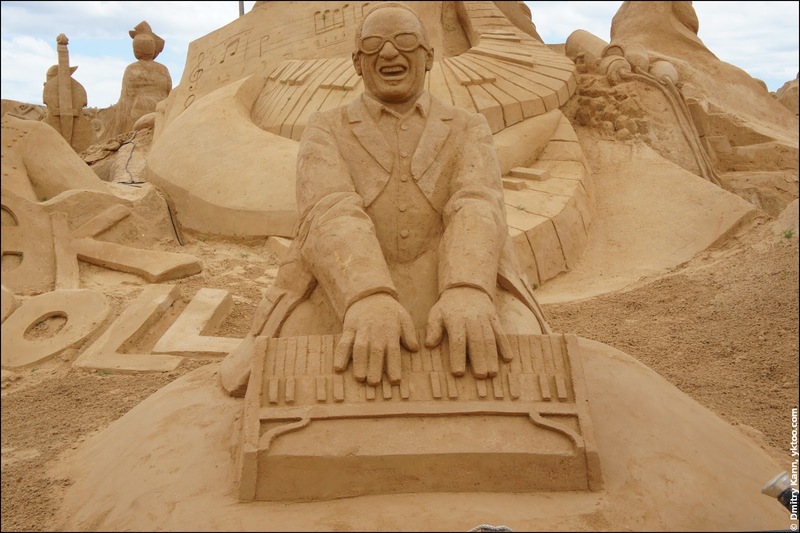 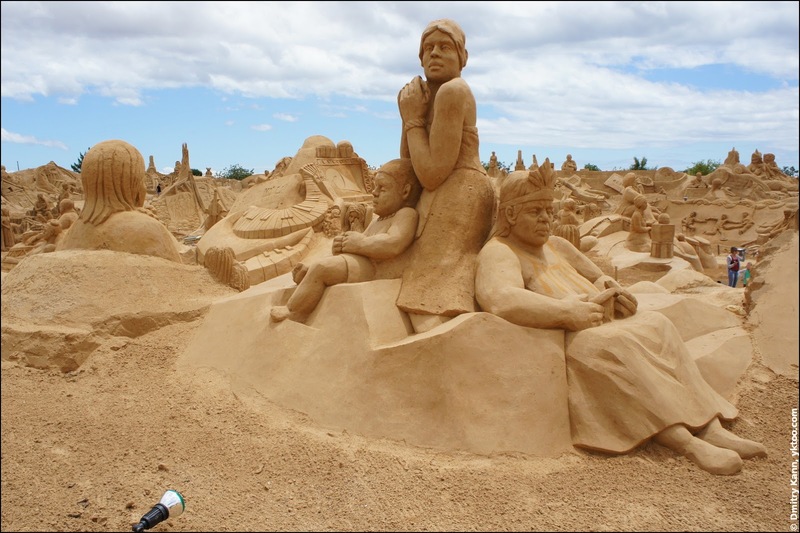 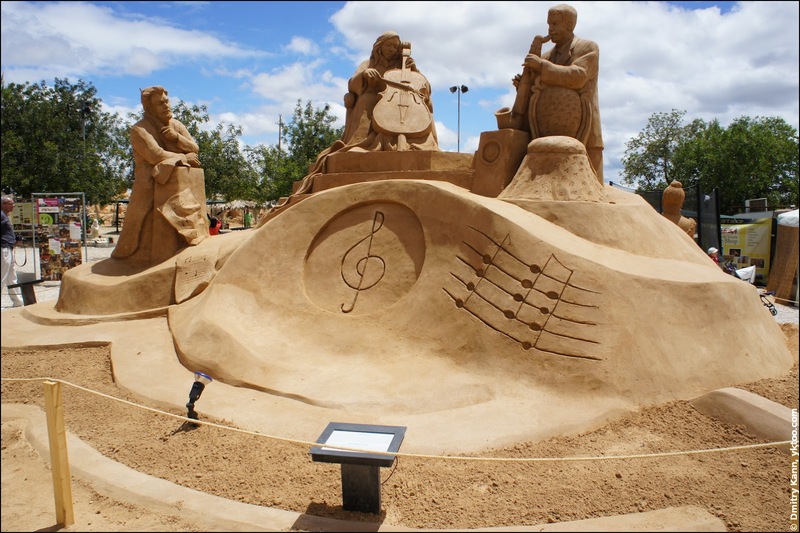 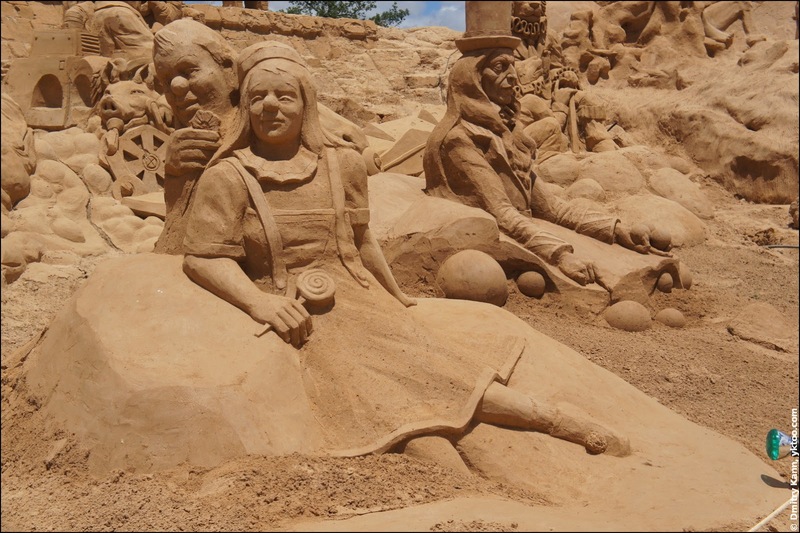 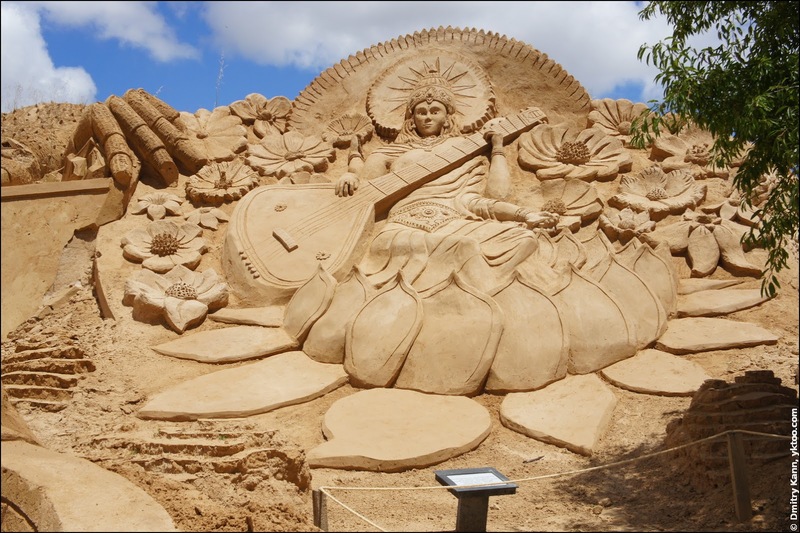 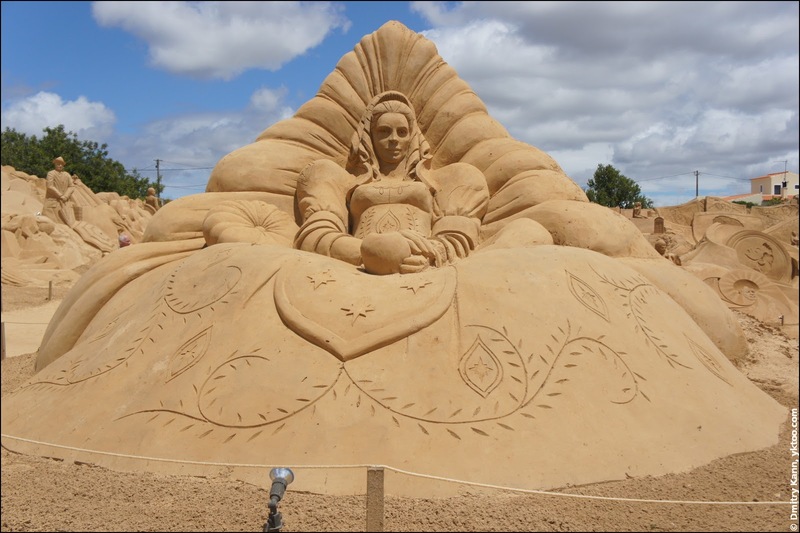 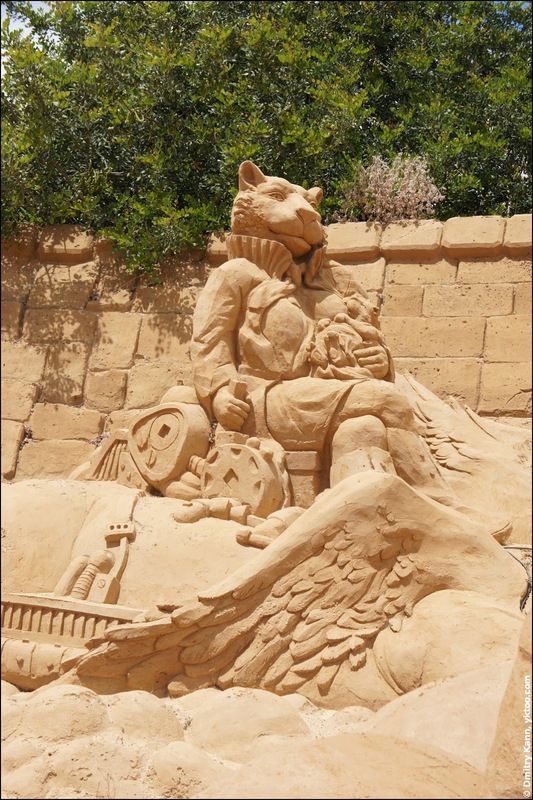 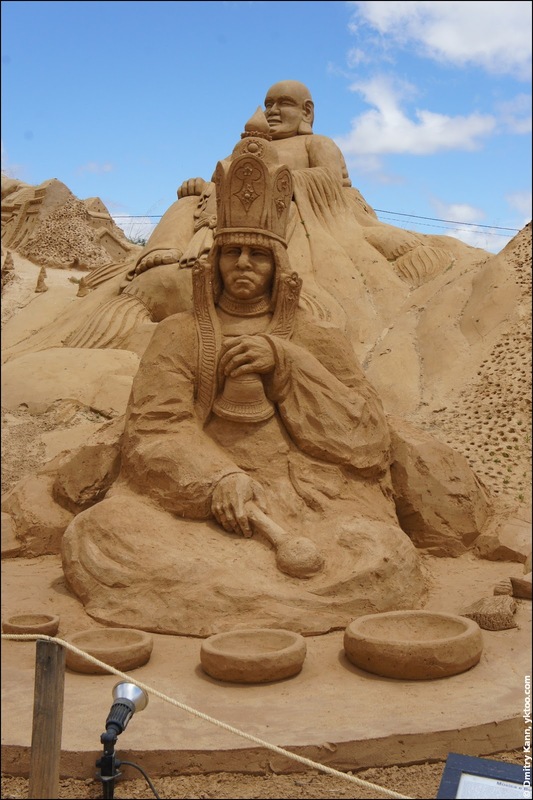 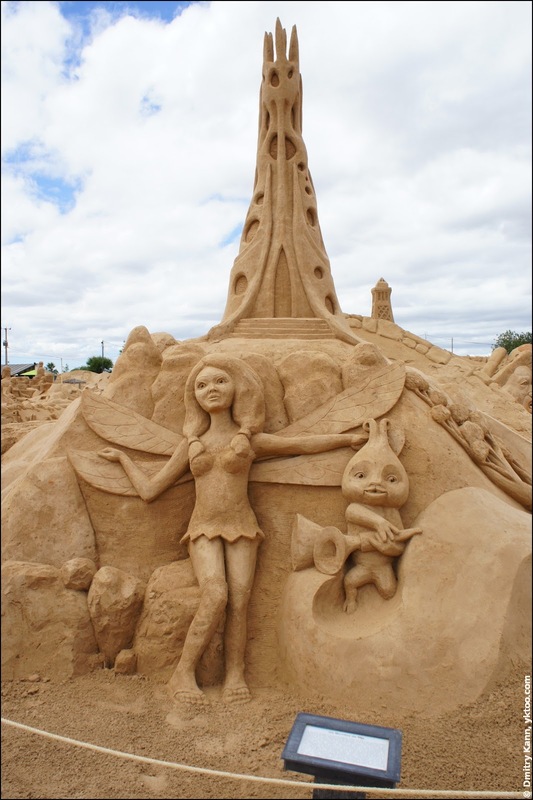 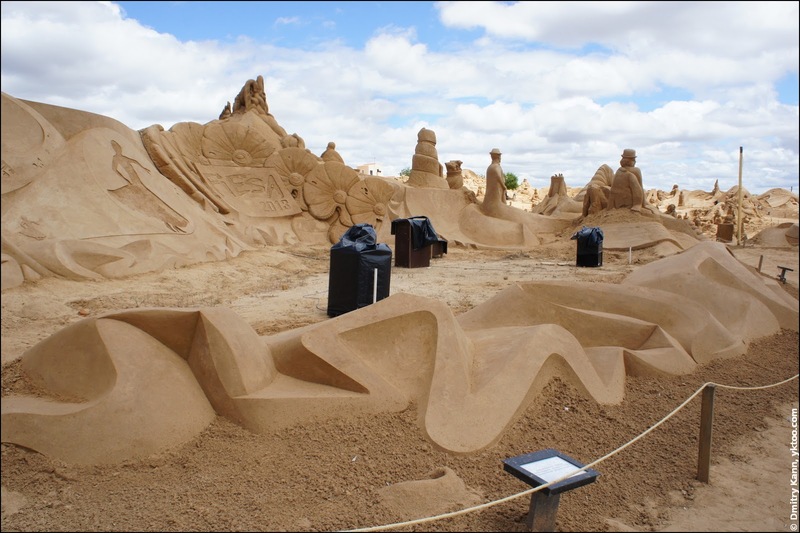 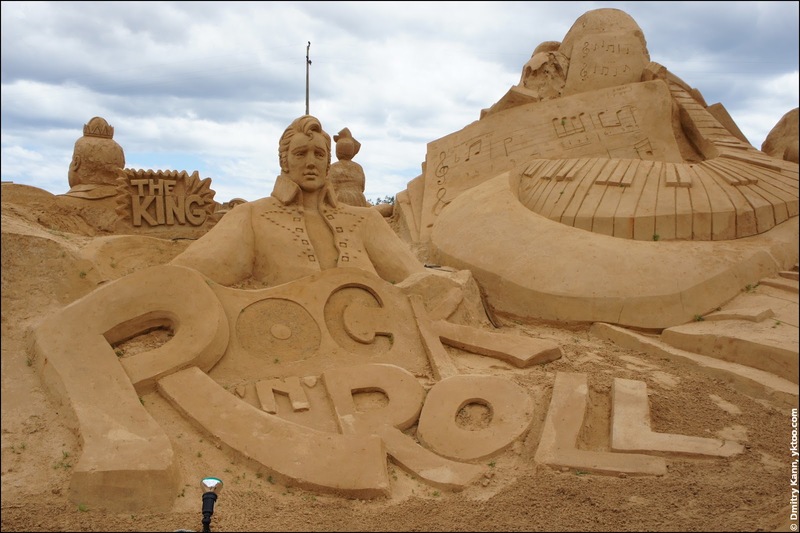 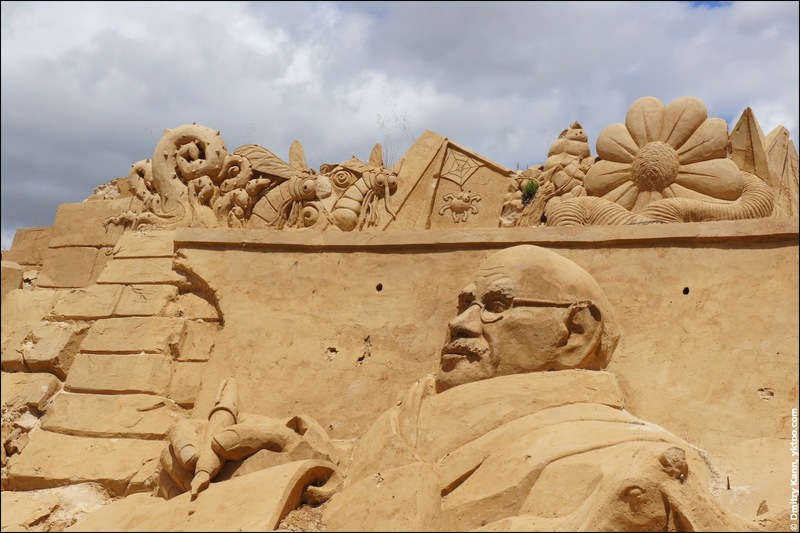 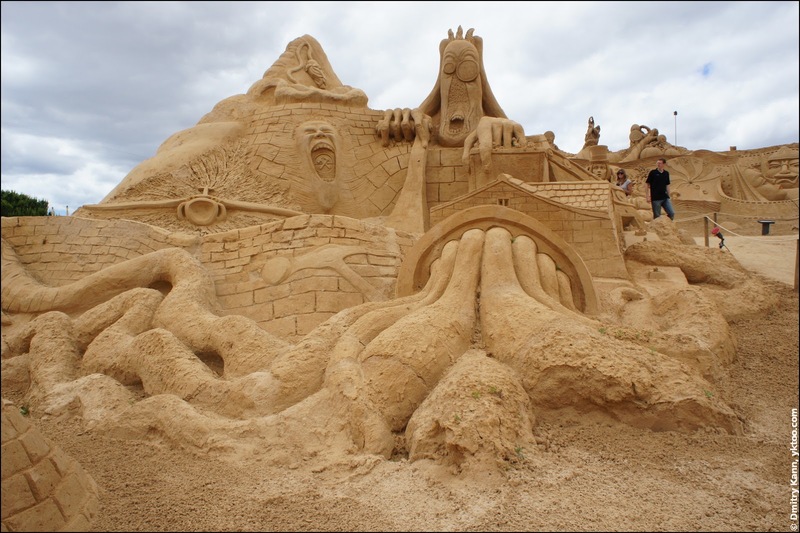 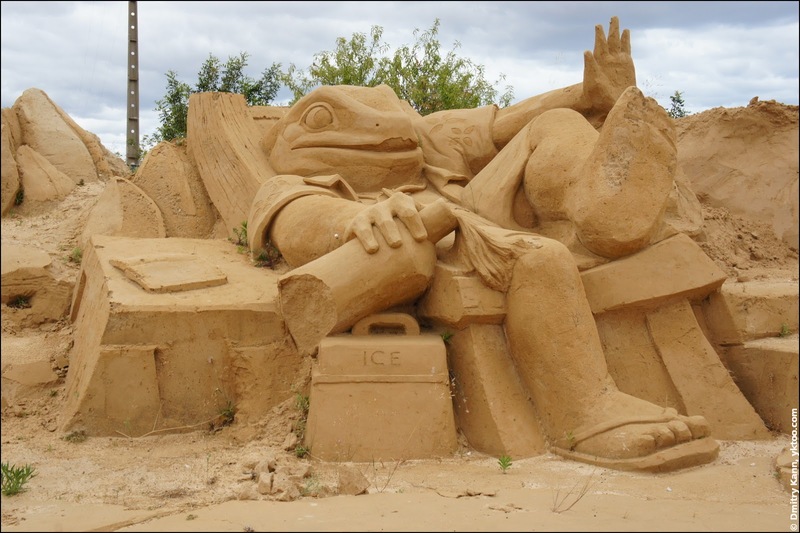 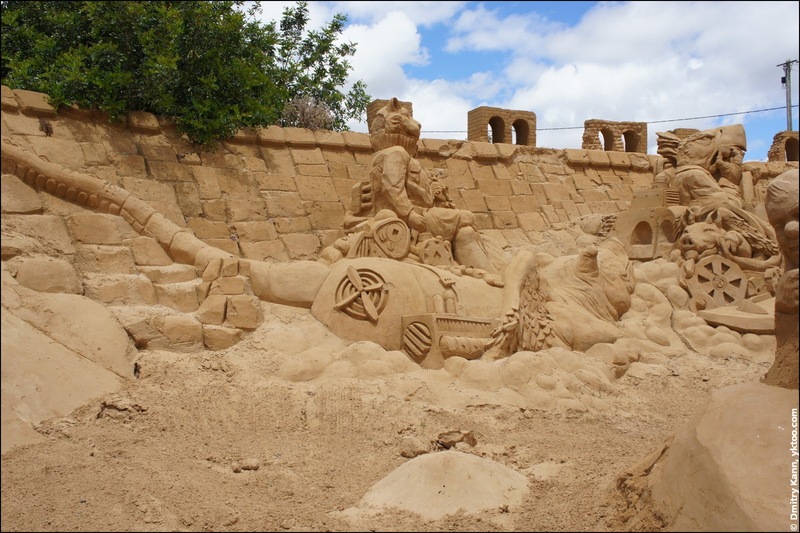 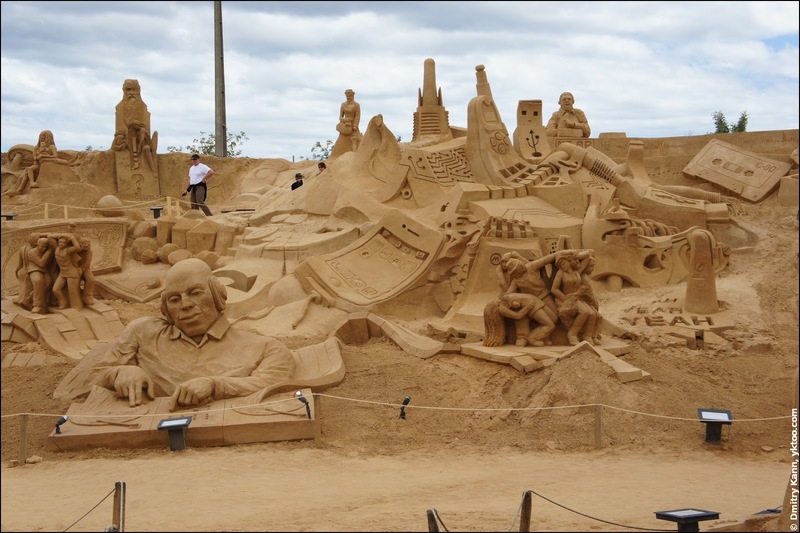 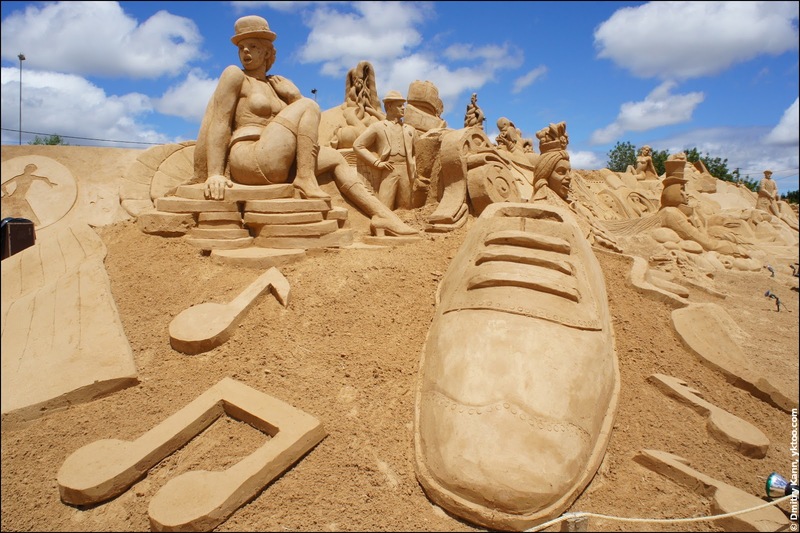 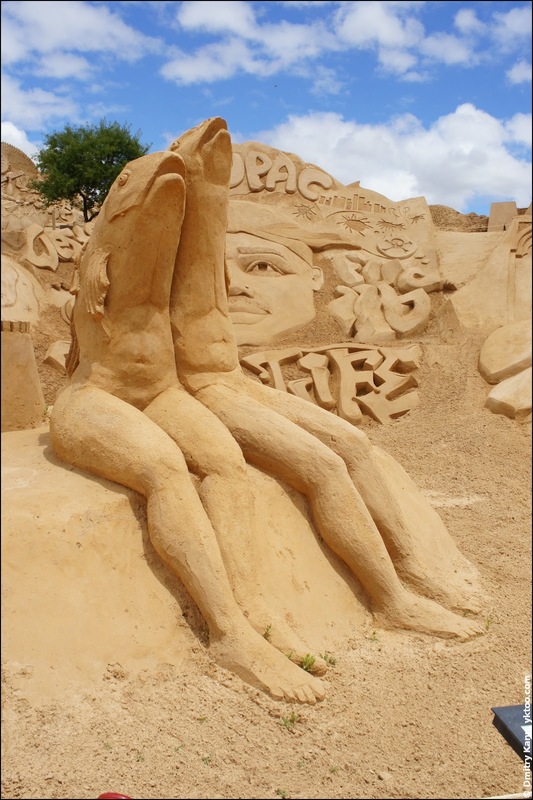 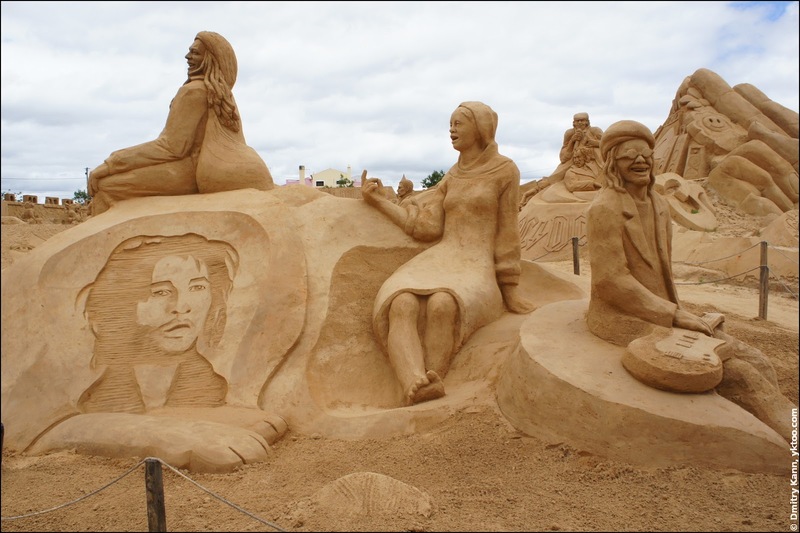 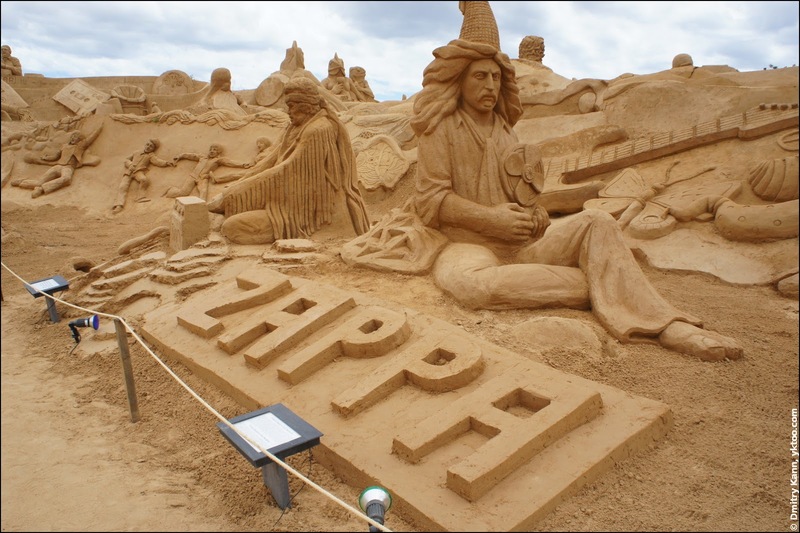 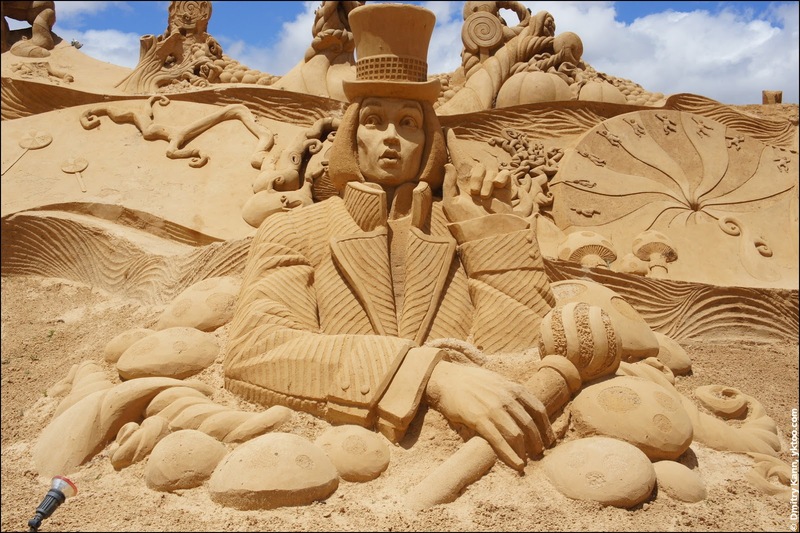 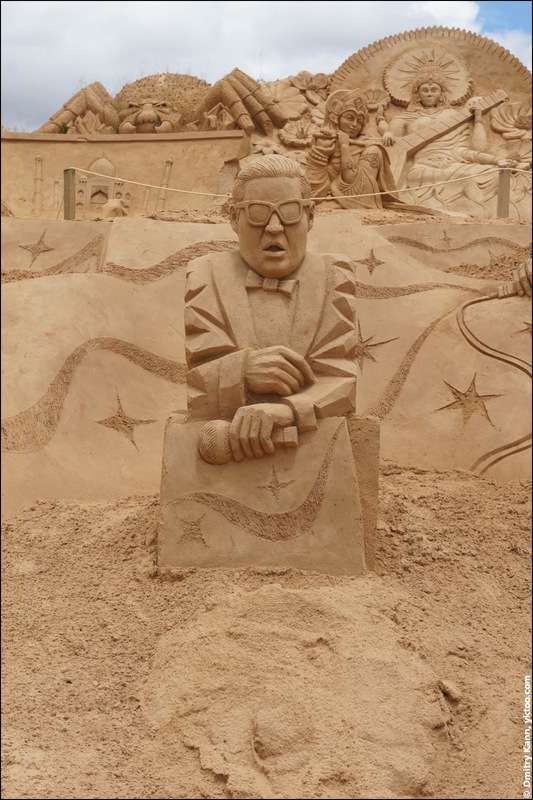 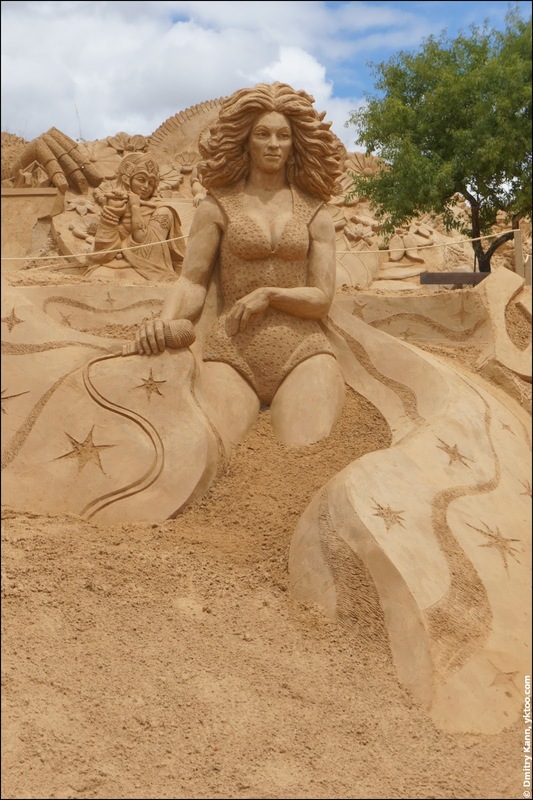 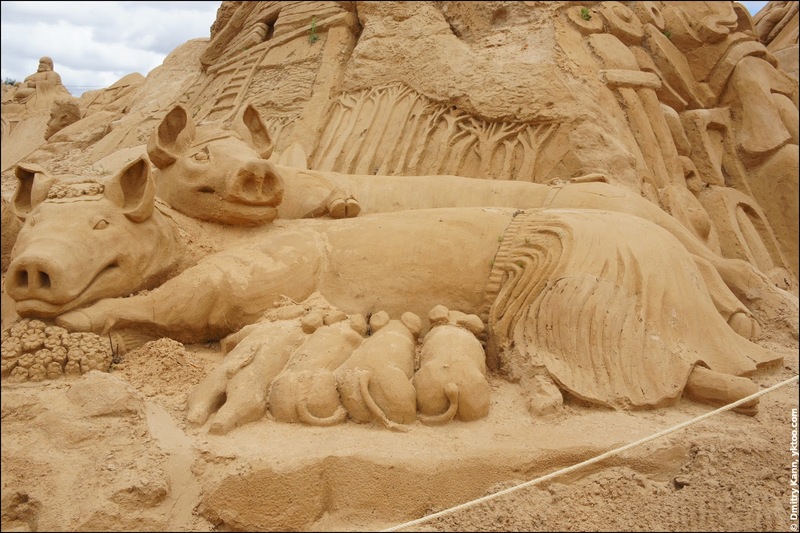 One of the noteworthy places we've never heard about before is the International Sand Sculpture Festival (Festival Internacional de Escultura em Areia or FIESA). 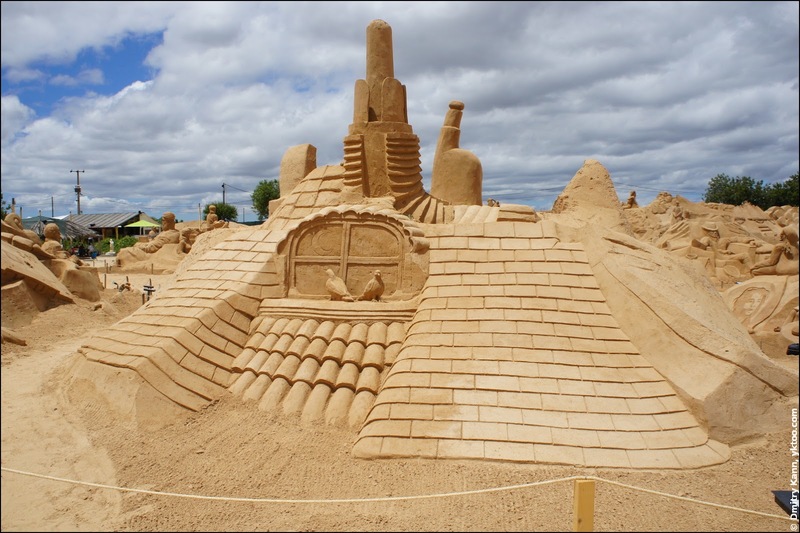 Which is, as they put it, the biggest sand city in the world. 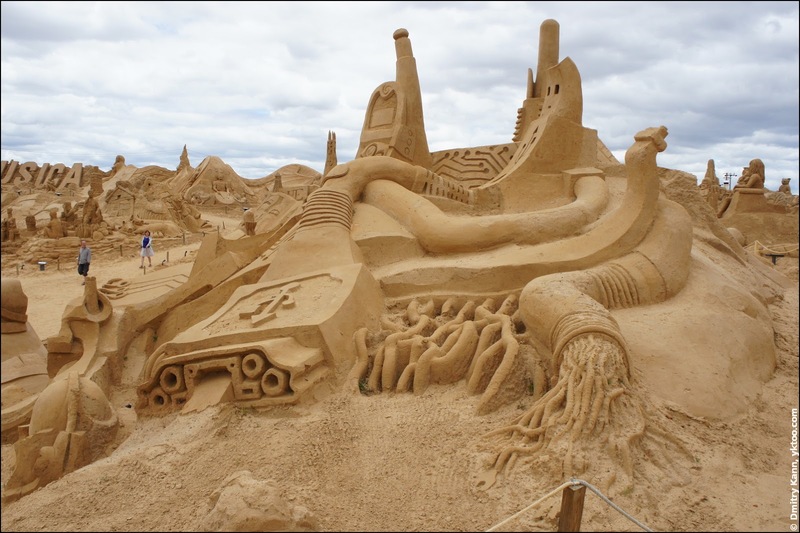 Since I'm not really into sand cities, I can't comment on it, but the amount of work invested is indeed impressive. 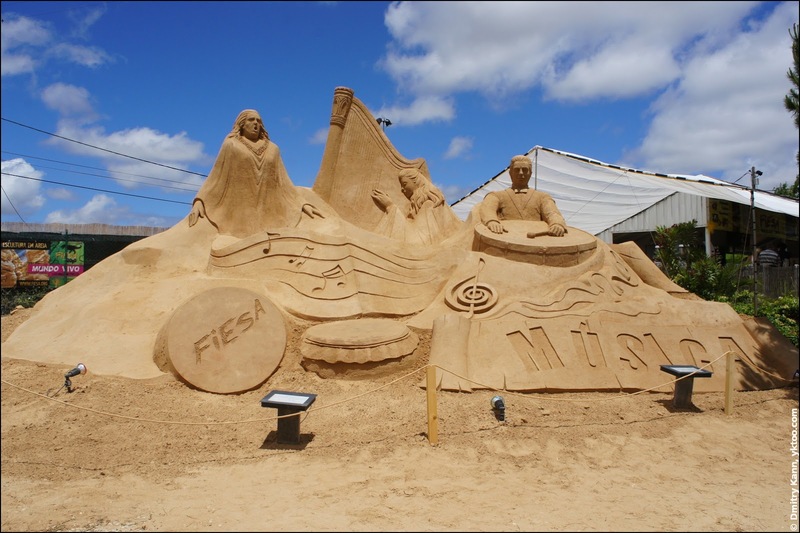 Each year FIESA introduces a different theme. 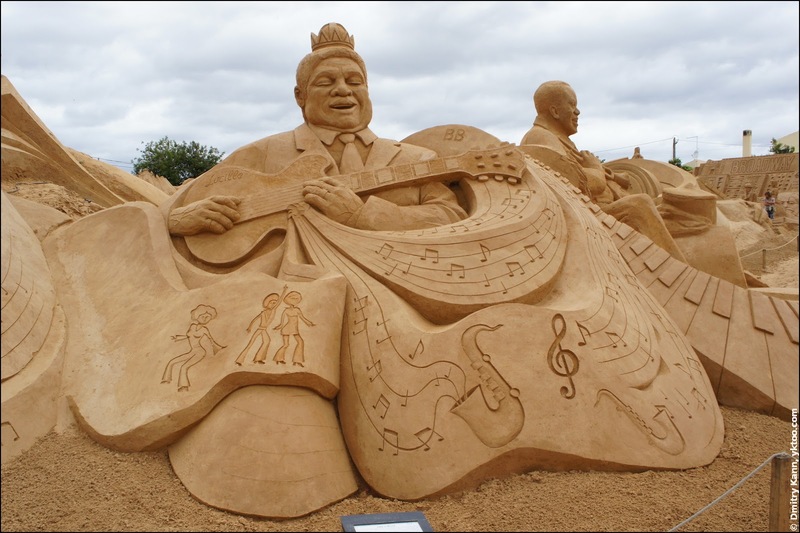 For 2013 the theme is Music. 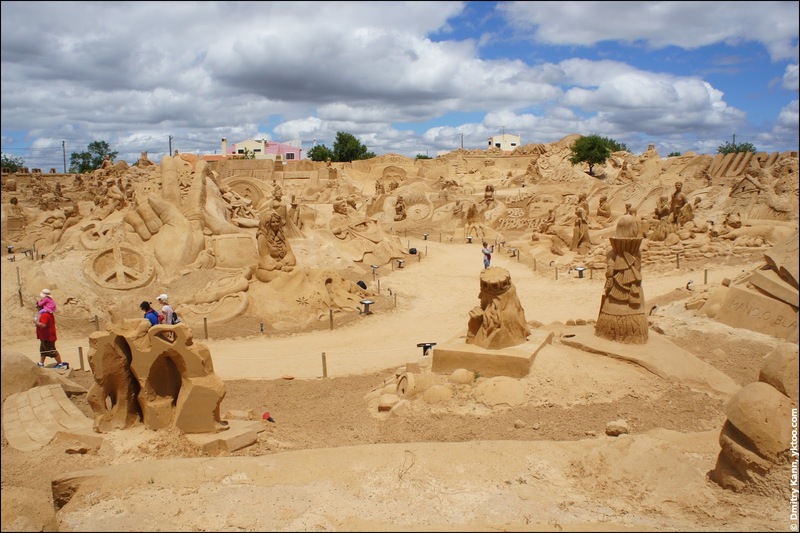 The sand city is situated near the Pêra village, which, in turn, is on the south coast of Portugal (here). 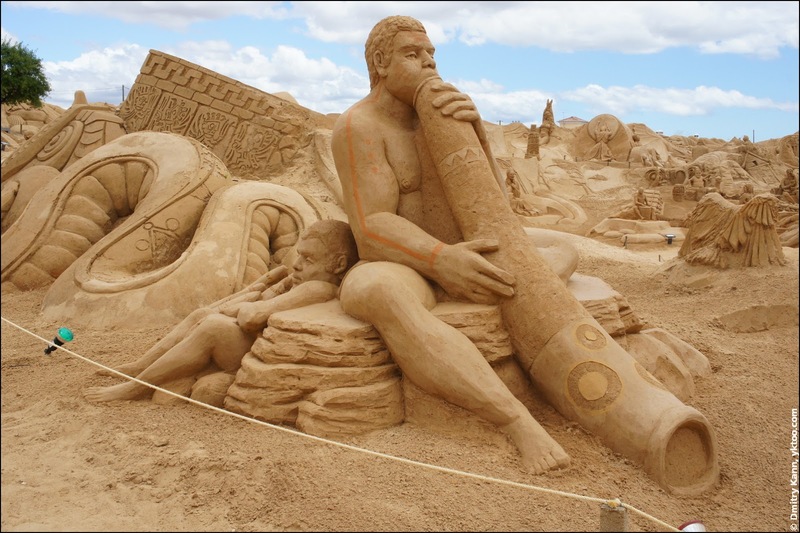 I'm not sure if it's reachable with public transport. 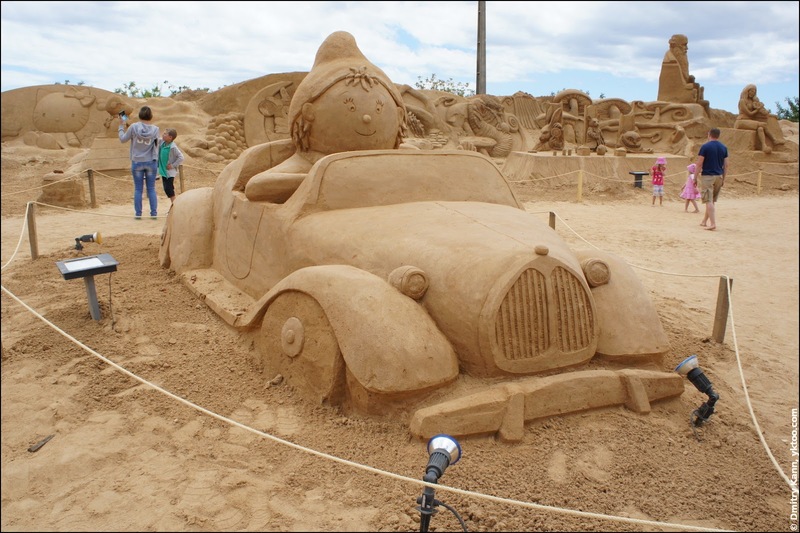 We went there with a car we rented at the hotel. 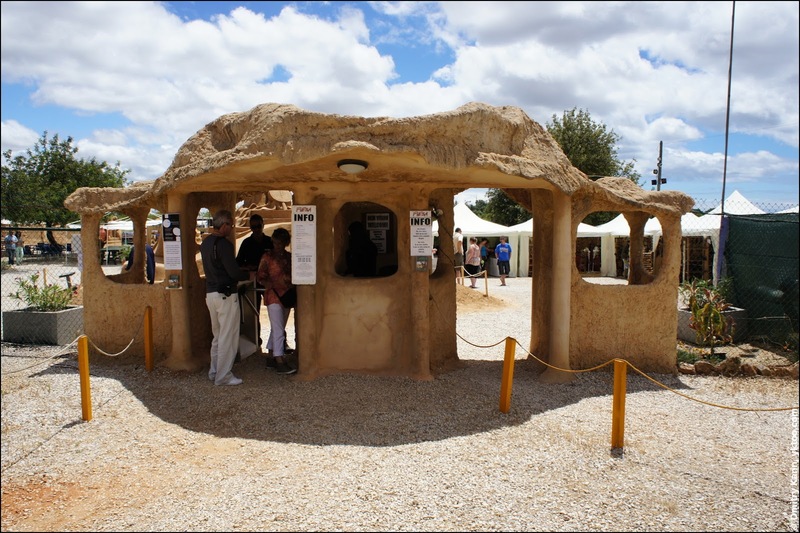 It all starts with the ticket desk. 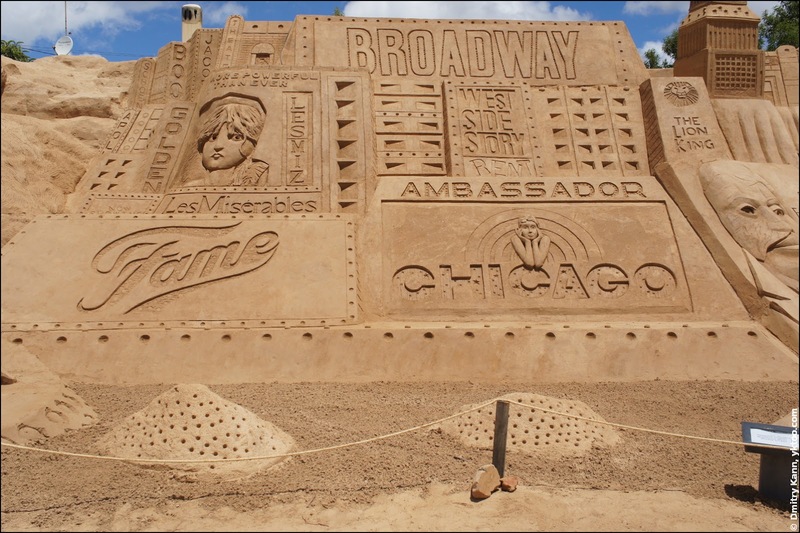 It's not made of sand, but still looks authentic. 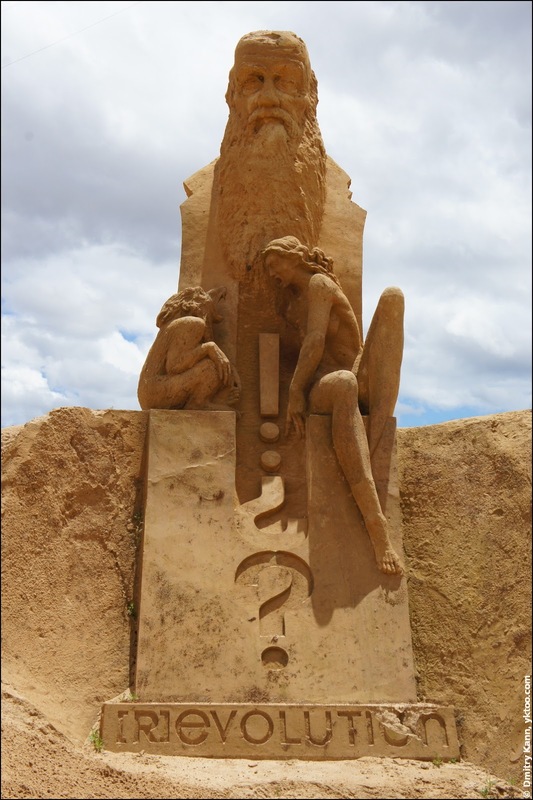 You ask yourself immediately a number of quesrtions. 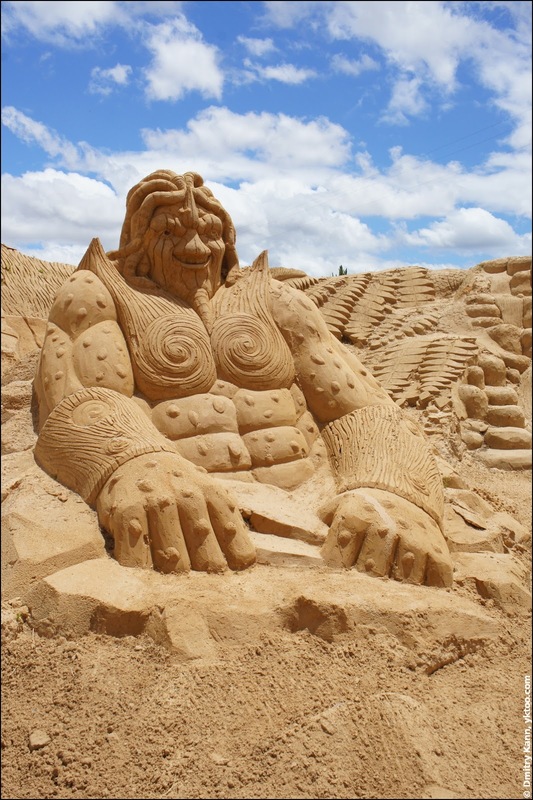 Are they really made of sand? 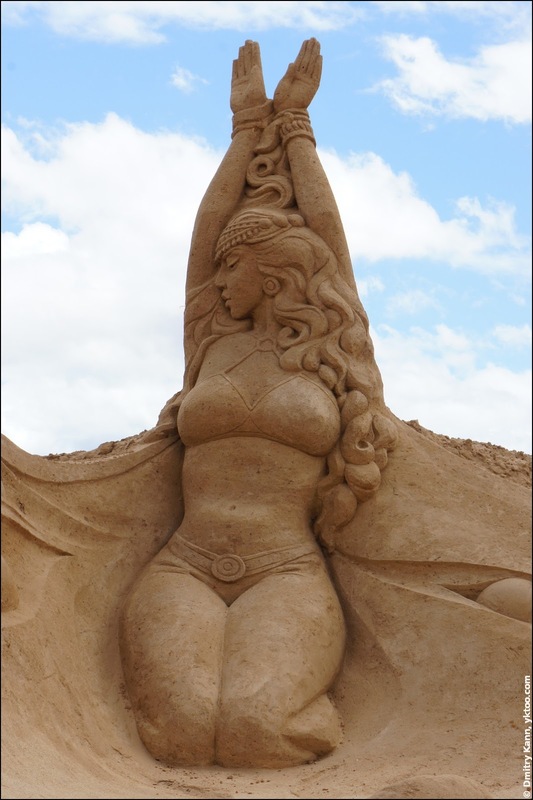 How come they look so solid and don't fall apart? 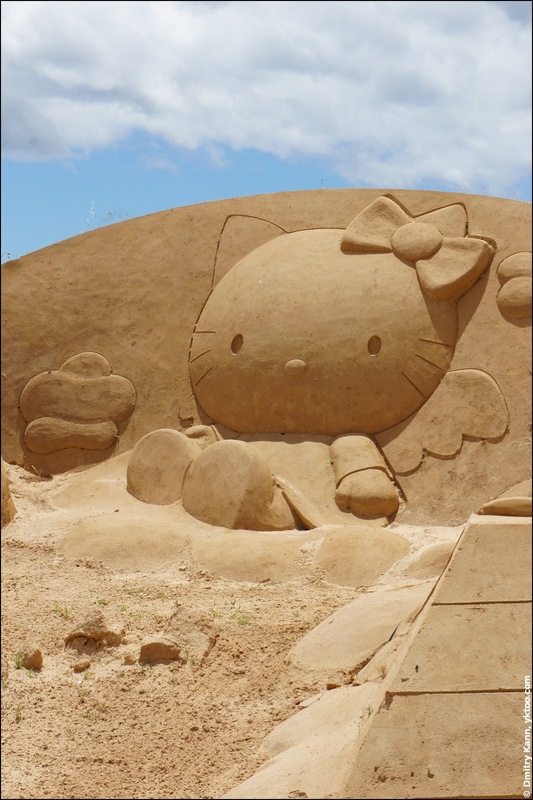 What'll happen if it rains? 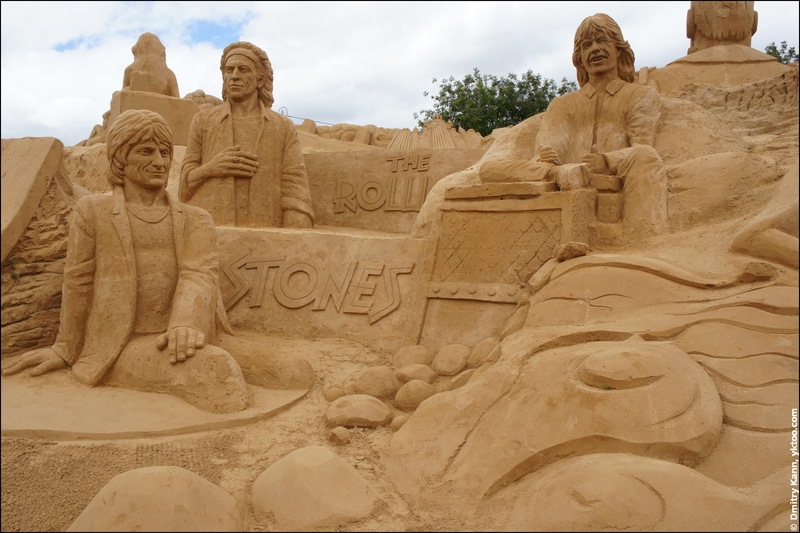 They are made of sand indeed. 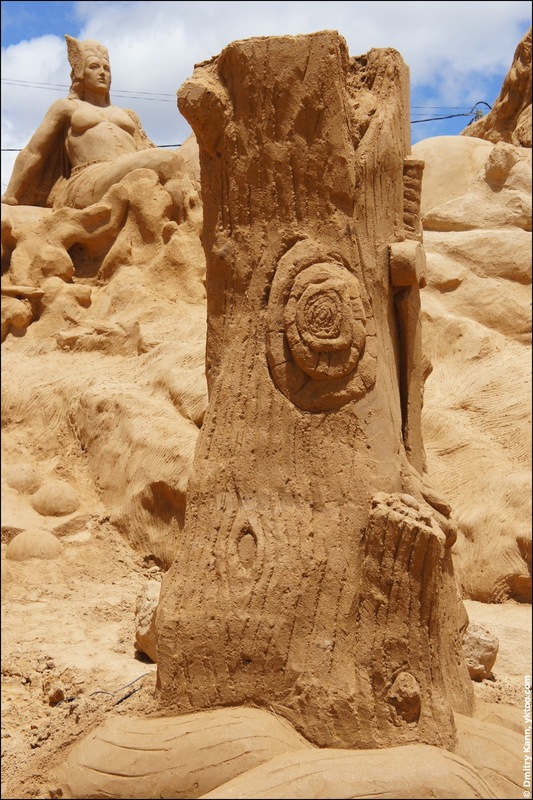 They stay integral thanks to treating the finished sculpture with a stabilising coating. 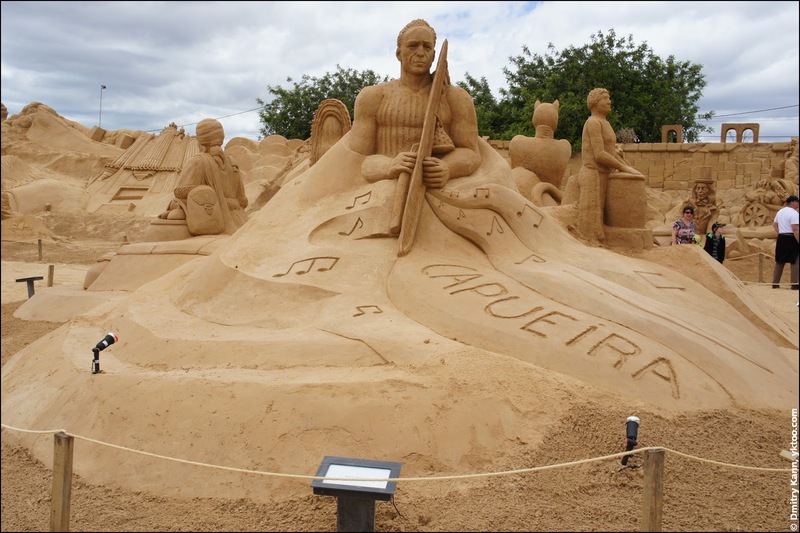 Rains are not that often in this time of year in Portugal, but I suspect a heavy rain will destroy the figures very quicly. 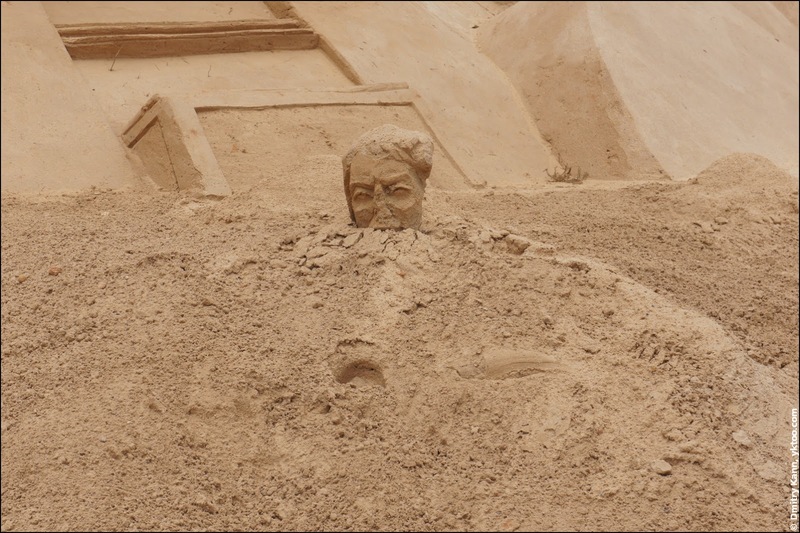 In such an event the staff will maybe cover them, but considering the size of the site that would require a whole army. 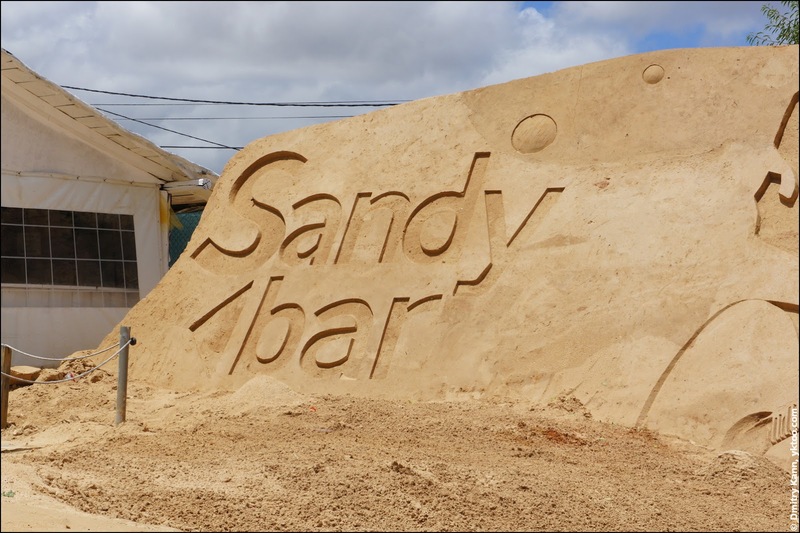 The first thing to see is a reminder about the Sandy bar. 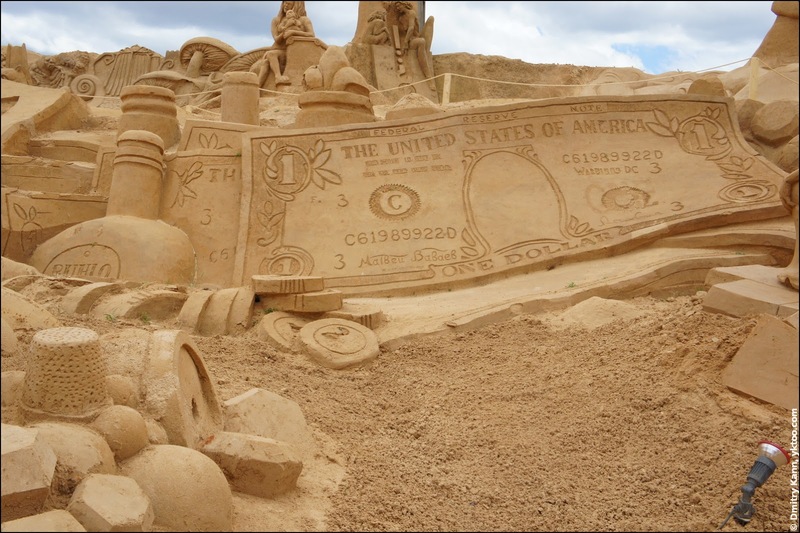 Which is very affordable, by the way. 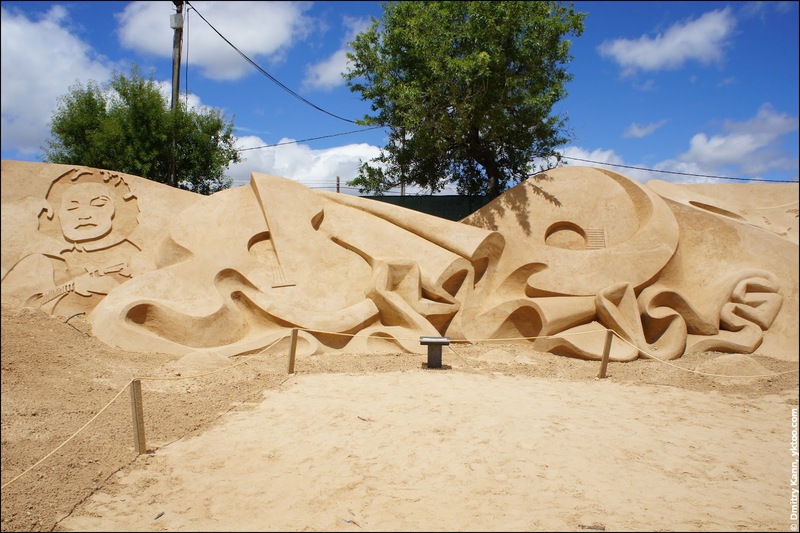 The letters are so clean and sharp that one must have used a stencil to make it. 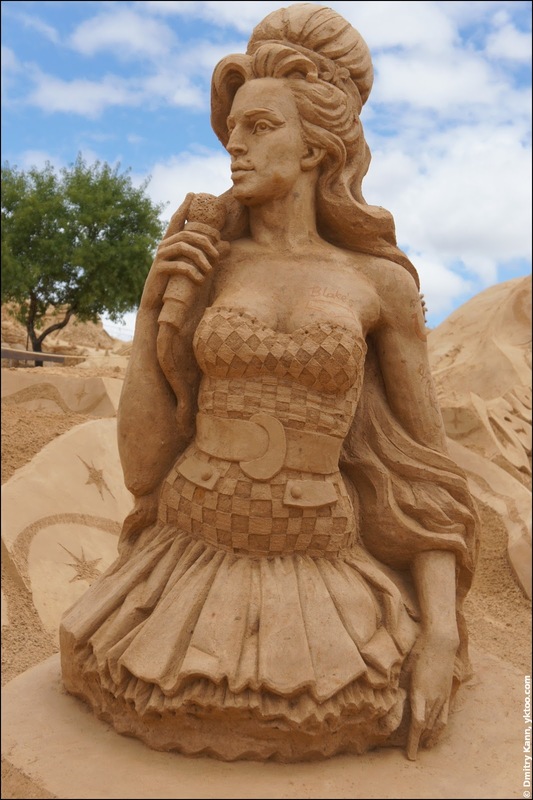 A sand portrait of Amália Rodrigues, "the voice of Portugal", a fado and flamenco singer. 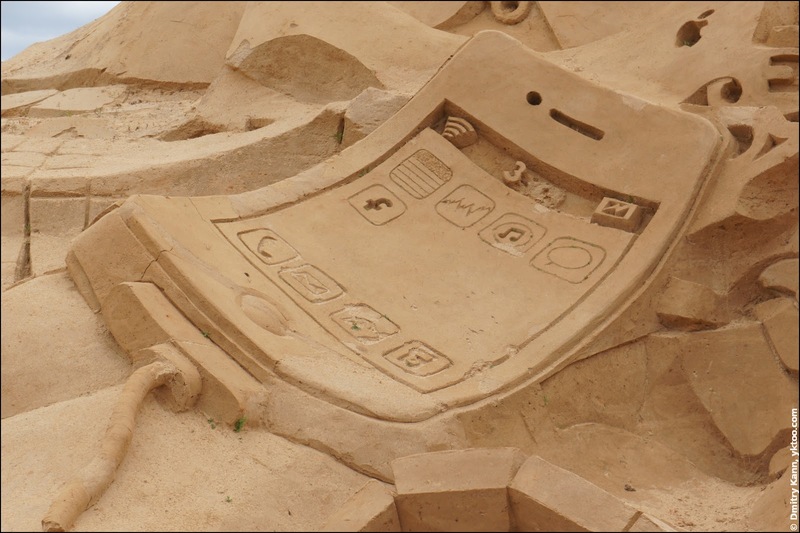 Even though it's a sand city, it has all the necessary facilities. 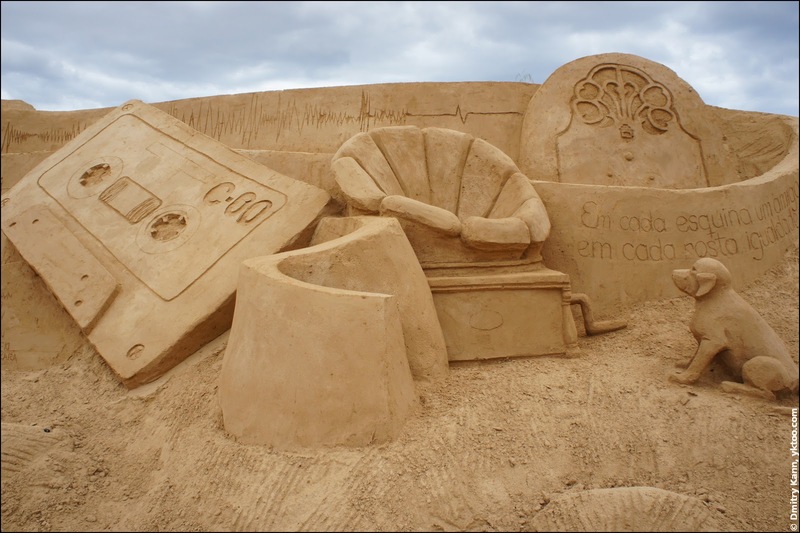 There are speakers all around (covered with film to protect them) as well as lighting. 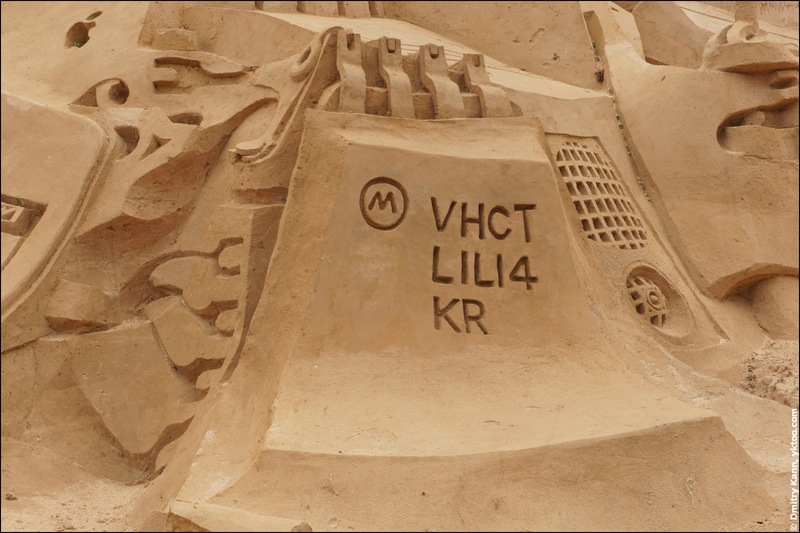 Every sculpture is accompanied by a description plate. 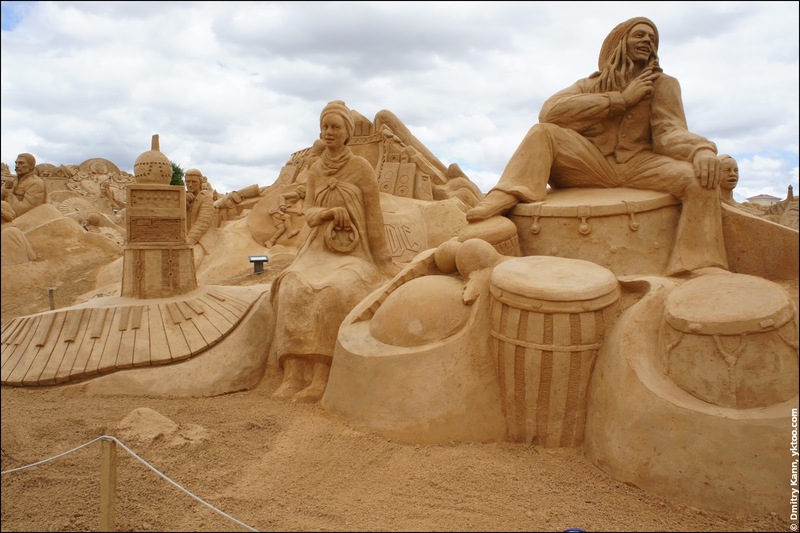 Cuban Music. 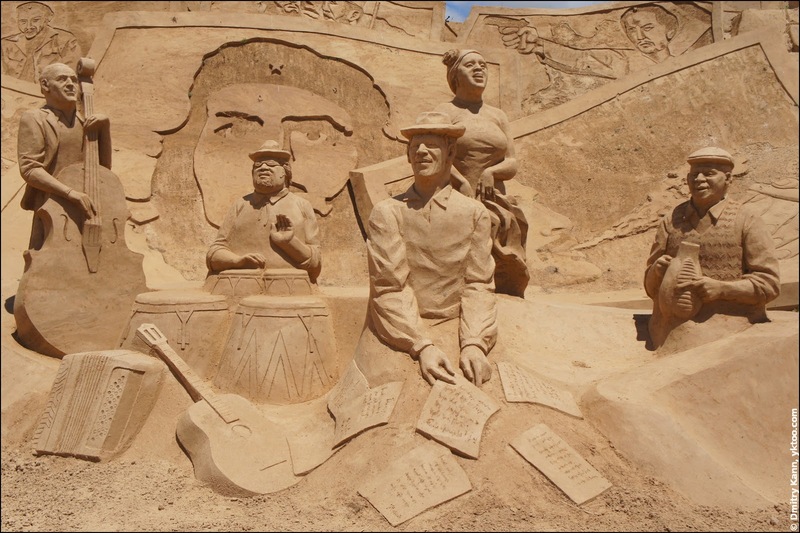 Compay Segund is on the front, Che Guevara image is on the background. 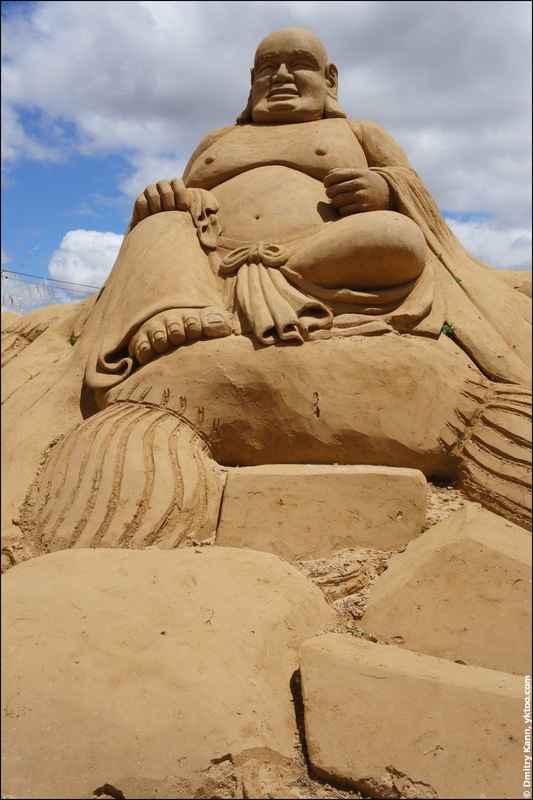 A Tibetan monk. 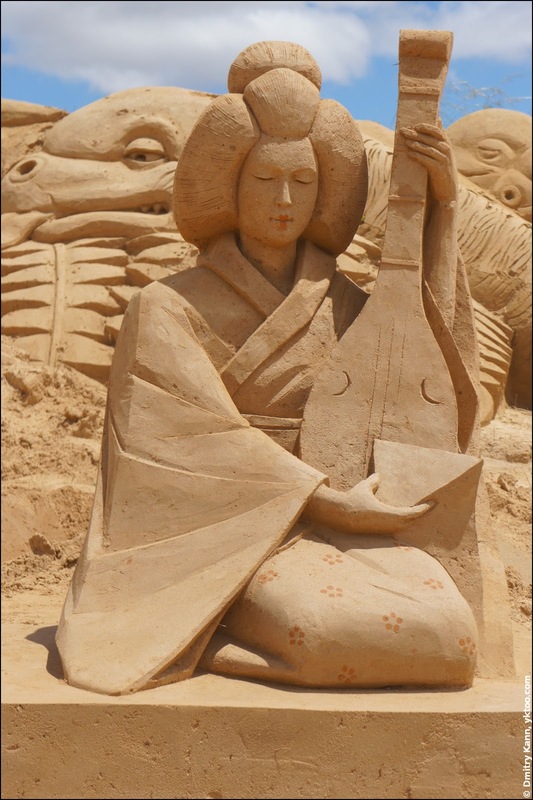 Music is an inherent element in buddhist rituals. 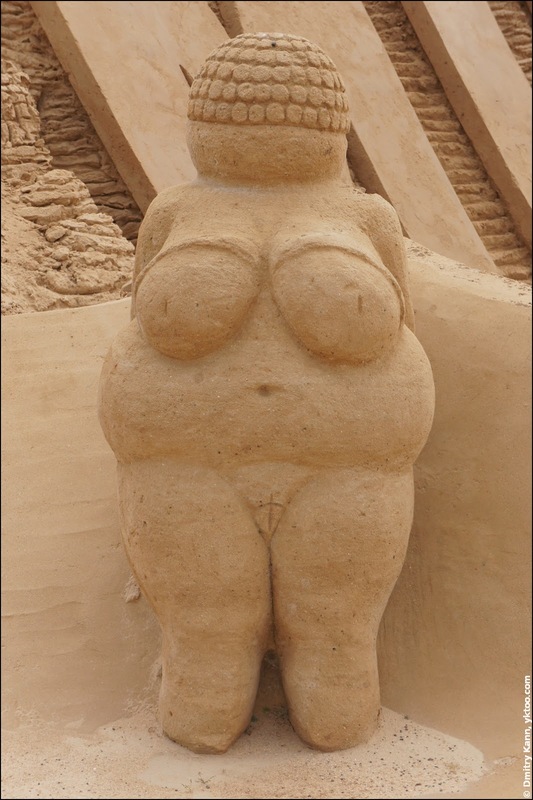 And this elegant woman's figure is Venus of Willendorf, an prehistoric statuette, originally just eleven centimetres high and twenty thousand years old. 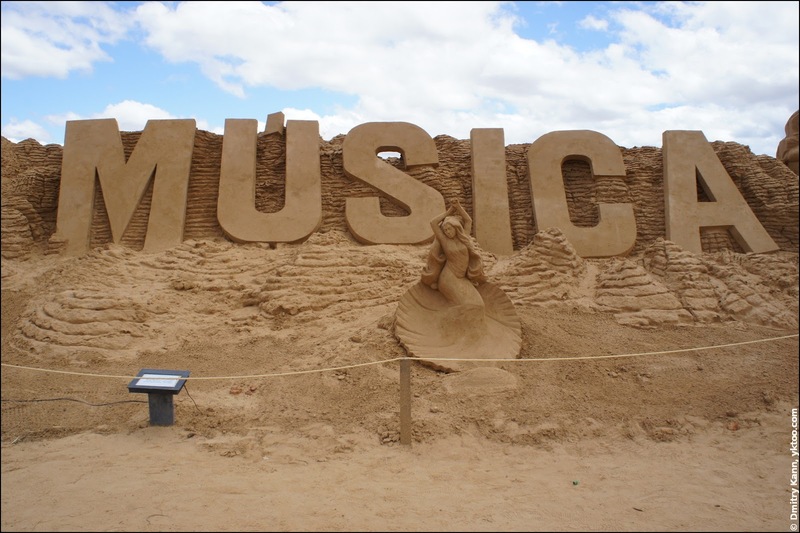 Music and Dance. 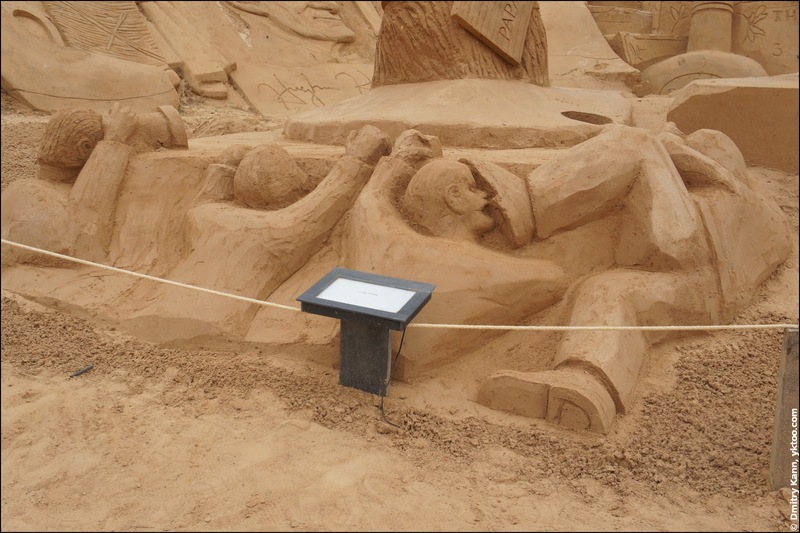 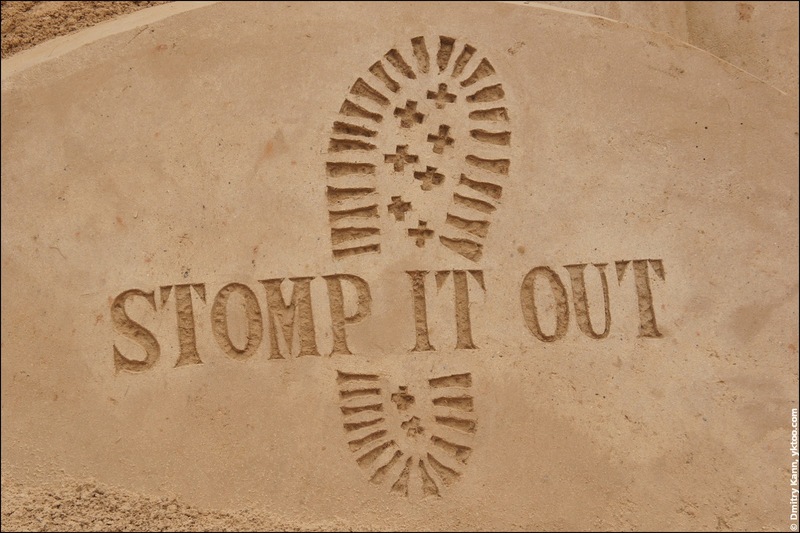 As they say, a new figure will emerge here in a sand sculpture demonstration session. 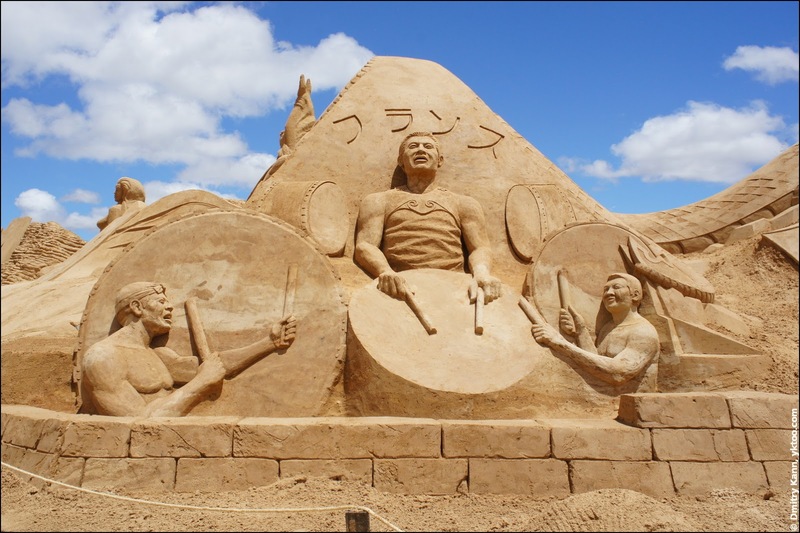 Taiko Drummers. 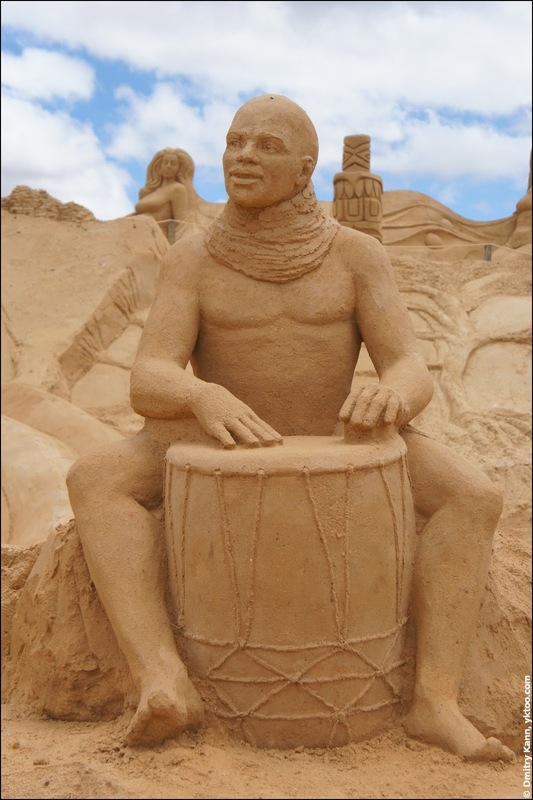 Taiko simply means "drum" in Japanese. 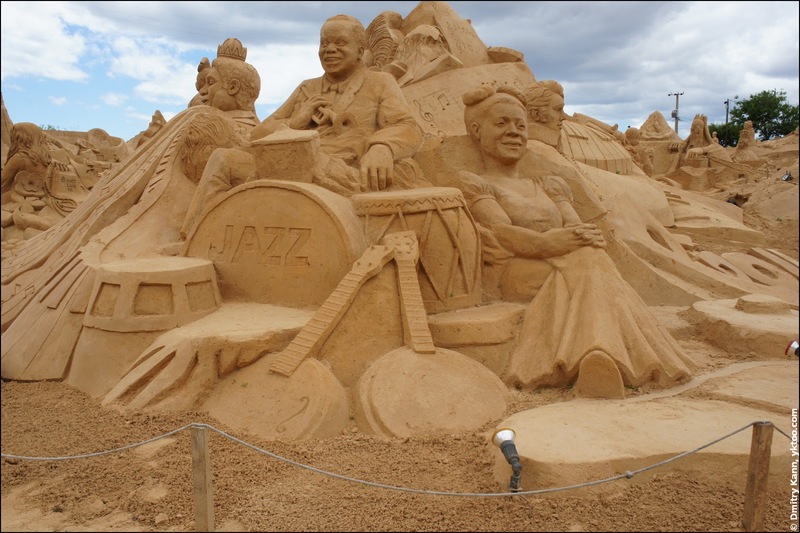 Players' facial expressions show the effort required to play fast rhythms. 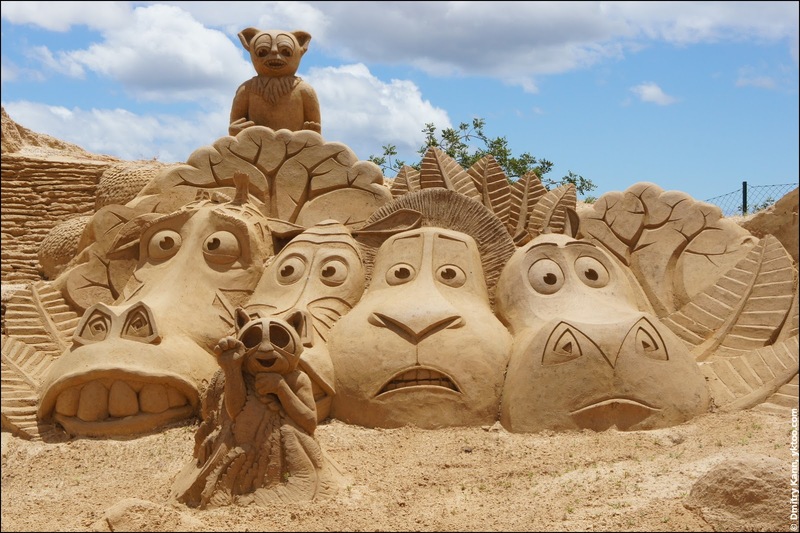 Let's step over to cartoons. 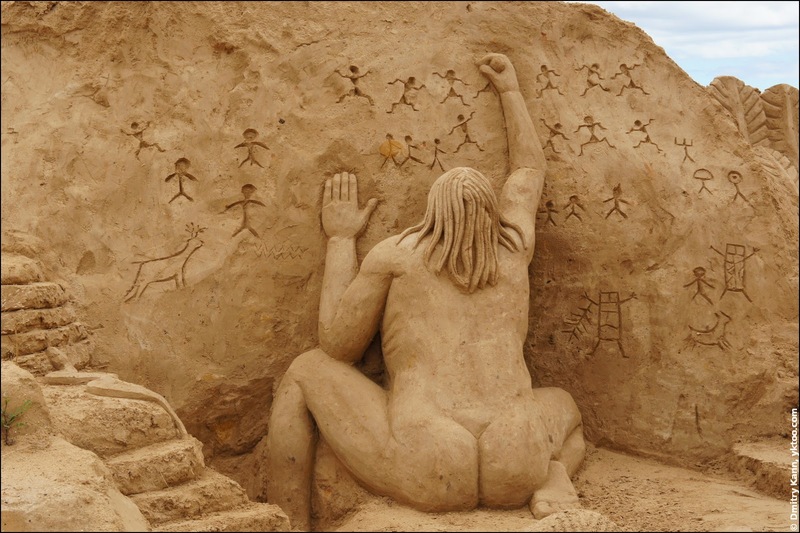 Evolution can sometimes result in unexpected outcomes. 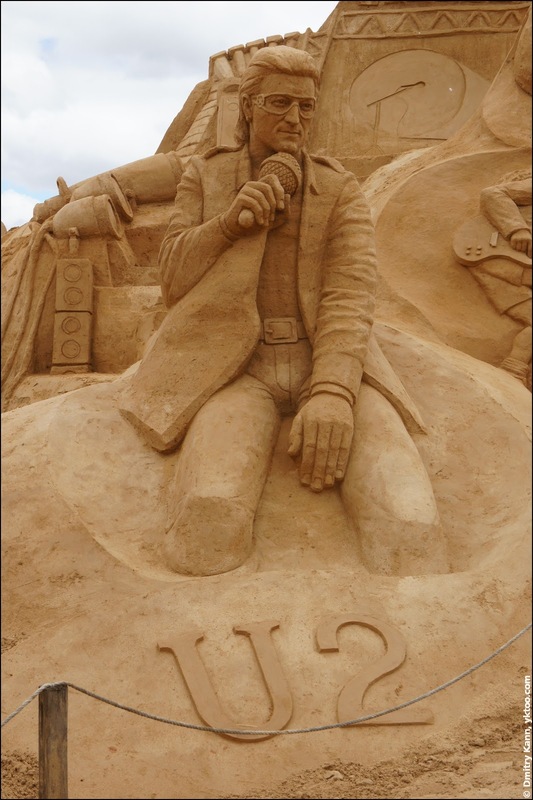 The bird behind Bowie is watching you, %username%! 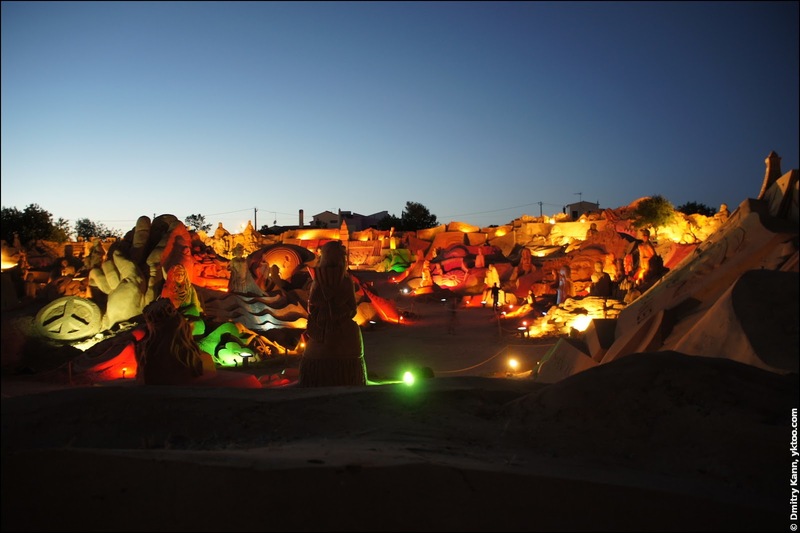 An overview. 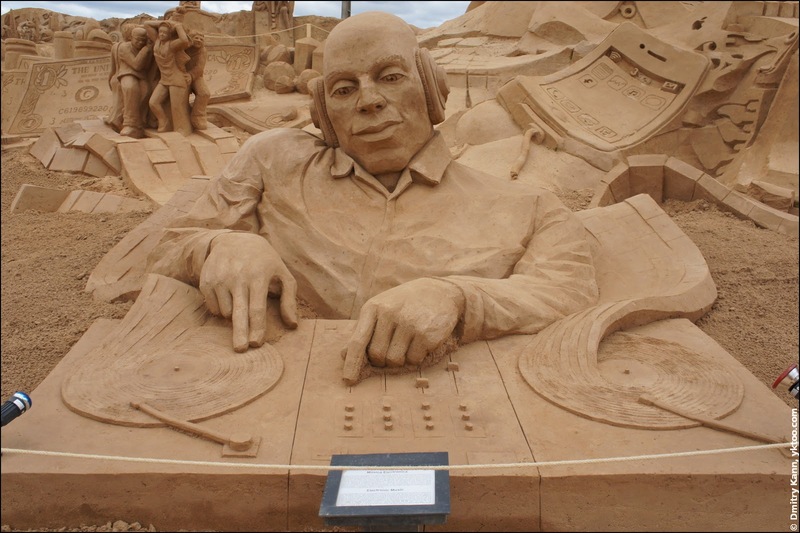 Behind the DJ you can see a mix of old and new tech. 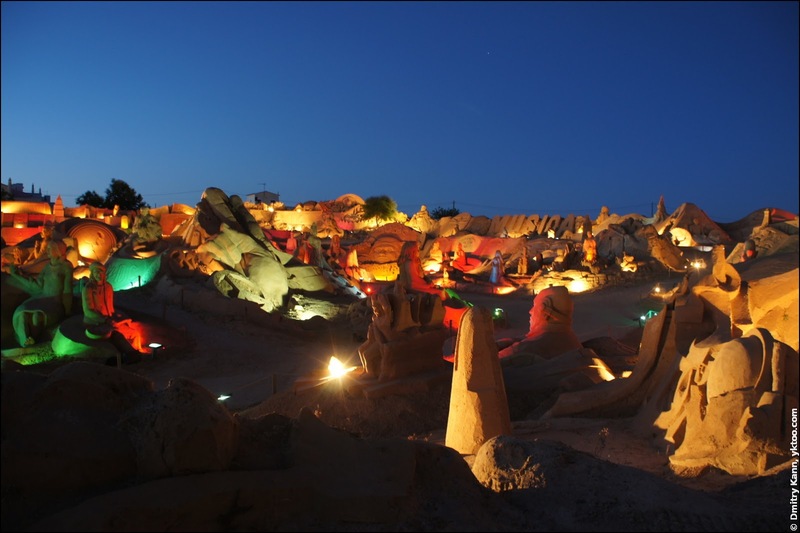 We were interested to see how it all looks in the darkness, so we agreed with the ticket office to come in the evening again.